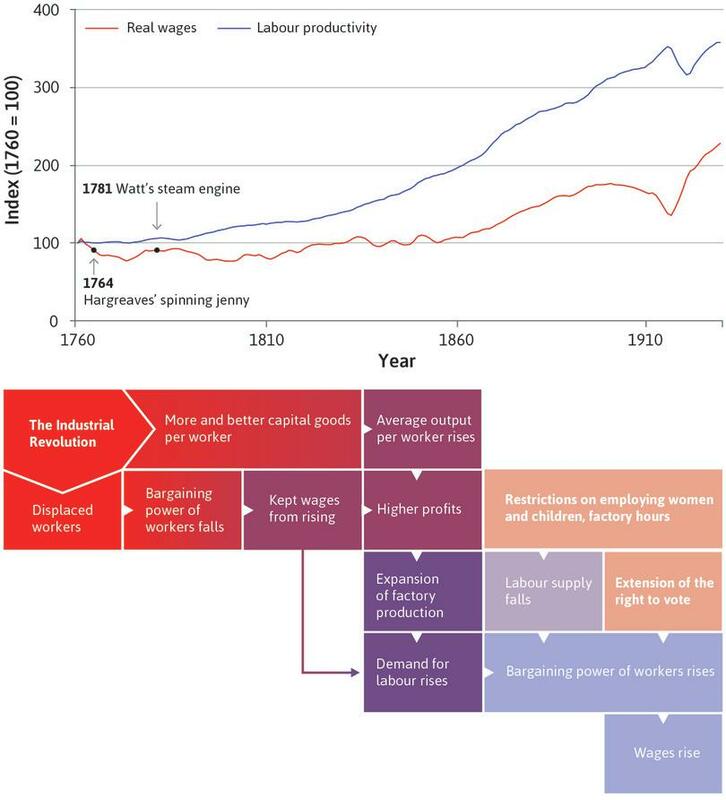 Economic models help explain the Industrial Revolution, and why it started in Britain. Wages, the cost of machinery, and other prices all matter when people make economic decisions. In a capitalist economy, innovation creates temporary rewards for the innovator, which provide incentives for improvements in technology that reduce costs. These rewards are destroyed by competition once the innovation diffuses throughout the economy. Population, the productivity of labour, and living standards may interact to produce a vicious circle of economic stagnation. The permanent technological revolution associated with capitalism allowed some countries to make a transition to sustained growth in living standards. In 1845, a mysterious disease appeared for the first time in Ireland. It caused potatoes to rot in the ground, but by the time it became clear that a plant was infected, it was too late. The ‘potato blight’, as it became known, devastated Irish food supplies for the rest of the decade. Starvation spread. By the time the Irish famine ended, about a million people out of an initial total of 8.5 million had died, which in percentage terms is equivalent to the mortality suffered by Germany through defeat in the Second World War. The Irish famine sparked a worldwide relief effort. Former slaves in the Caribbean, convicts in Sing Sing prison in New York, Bengalis both rich and poor, and Choctaw Native Americans all donated money, as did celebrities such as the Ottoman Sultan Abdulmecid and Pope Pius IX. Then, as now, ordinary people felt empathy for others who were suffering, and acted accordingly. Malthus held that a sustained increase in income per capita would be impossible. His logic was that, even if technology improved and raised the productivity of labour, people would still have more children as soon as they were somewhat better off. This population growth would continue until living standards fell to subsistence level, halting the population increase. Malthus’ vicious circle of poverty was widely accepted as inevitable. It provided an explanation of the world in which Malthus lived, in which incomes might fluctuate from year to year or even century to century, but not trend upwards. This had been the case in many countries for at least 700 years before Malthus published his essay, as we saw in Figure 1.1a. Unlike Adam Smith, whose book The Wealth of Nations had appeared just 22 years earlier, Malthus did not offer an optimistic vision of economic progress—at least as far as ordinary farmers or workers were concerned. Even if people succeeded in improving technology, in the long run the vast majority would earn enough from their jobs or their farms to keep them alive, and no more. But in Malthus’ lifetime something big was happening all around him, changes that would soon allow Britain to escape from the vicious circle of population growth and income stagnation that he described. The change that had sprung Britain from the Malthusian trap, and would do the same for many countries in the 100 years that followed, is known as the Industrial Revolution—an extraordinary flowering of radical invention that allowed the same output to be produced with less labour. In textiles, the most famous inventions involved spinning (traditionally carried out by women known as spinsters, meaning female spinner, a term which has come to mean an older unmarried woman), and weaving (traditionally carried out by men). In 1733, John Kay invented the flying shuttle, which greatly increased the amount a weaver could produce in an hour. This increased the demand for the yarn that was used in weaving to the point where it became difficult for spinsters to produce sufficient quantities using the spinning wheel technology of the day. James Hargreaves’ spinning jenny, introduced in 1764, was a response to this problem. Technological improvements in other areas were equally dramatic. James Watt’s steam engine, introduced at the same time as Adam Smith published The Wealth of Nations, was a typical example. These engines were gradually improved over a long period of time and were eventually used across the economy: not just in mining, where the first steam engine powered water pumps, but also in textiles, manufacturing, railways and steamships. They are an example of what is termed a general-purpose innovation or technology. In recent decades the most obvious equivalent is the computer. Coal played a central role in the Industrial Revolution, and Great Britain had a lot of it. Prior to the Industrial Revolution, most of the energy used in the economy was ultimately produced by edible plants, which converted sunlight into food for both animals and people, or by trees whose wood could be burned or transformed into charcoal. By switching to coal, humans were able to exploit a vast reserve of what is effectively stored sunlight. The cost has been the environmental impact of burning fossil fuels, as we saw in Unit 1 and will return to in Unit 20. These inventions, alongside other innovations of the Industrial Revolution, broke Malthus’ vicious circle. Advances in technology and the increased use of non-renewable resources raised the amount that a person could produce in a given amount of time (productivity), allowing incomes to rise even as the population was increasing. And as long as technology continued improving quickly enough, it could outpace the population growth that resulted from the increased income. Living standards could then rise. Much later, people would prefer smaller families, even when they earned enough to afford to have a lot of children. This is what happened in Britain, and later in many parts of the world. Real wages over seven centuries: Wages of craftsmen (skilled workers) in London (1264–2001), and the population of Britain. Figure 2.1 Real wages over seven centuries: Wages of craftsmen (skilled workers) in London (1264–2001), and the population of Britain. Robert C. Allen. 2001. ‘The Great Divergence in European Wages and Prices from the Middle Ages to the First World War’. Explorations in Economic History 38 (4): pp. 411–447; Stephen Broadberry, Bruce Campbell, Alexander Klein, Mark Overton and Bas van Leeuwen. 2015. British Economic Growth, 1270–1870, Cambridge University Press. Figure 2.1 shows an index of the average real wage (the money wage in each year, adjusted for changes in prices) of skilled craftsmen in London from 1264 to 2001, plotted together with the population of Britain over the same period. There is a long period in which living standards were trapped according to Malthusian logic, followed by a dramatic increase after 1830. You can see that at the time both were increasing. The term ‘index’ means the value of some quantitative amount relative to its value at some other time (the reference period) which is usually normalized to 100. The term ‘real’ means that the money wage (say, six shillings per hour at the time) in each year has been adjusted to take account of changes in prices over time. The result represents the real buying power of the money the workers earned. The reference year is 1850 in this case, but the curve would have the same shape if any other year had been selected. It would be positioned higher or lower, but would still look like our familiar hockey stick. Figure 2.1 shows an index of average real wages of skilled workers in London between 1264 and 2001. What can we conclude from this graph? Skilled workers were paid about £100 in 1408. The average wage in 1850 was about the same as that in 1408 in nominal terms (pounds). The average real wage was more or less constant between 1264 and 1850. The average real wage increased by around 600% between 1850 and 2001. This is a graph of an index of real wages. The index is approximately 100 in 1408, but this does not tell us what the money wage was. The wages graphed are real wages, so are adjusted to take account of changes in prices. Whilst the graph looks fairly constant between 1264 and 1850 compared to the rapid increase since 1850, the average real wage actually almost doubled and then halved again between 1264 and 1600 (look at the scale on the vertical axis). In 1850, the real wage index was approximately 100. By 2001, the index had increased by roughly six times that value, to more than 700. Why did the spinning jenny, the steam engine, and a cluster of other inventions emerge and spread across the economy in Britain at this time? This is one of the most important questions in economic history, and historians continue to argue about it. In this unit we examine one explanation of how these improvements in technology came about, and why they first occurred in Britain only, and during the eighteenth century. We will also explore why the long flat part of Figure 2.1’s hockey stick proved so hard to escape not only in Britain, but also throughout the world in the 200 years that followed. We will do this by building models: simplified representations that help us to understand what is going on by focusing attention on what is important. Models will help us understand both the kink in the hockey stick and the long flat handle. Why did the Industrial Revolution happen first in the eighteenth century, on an island off the coast of Europe? What we call the Industrial Revolution was more than just the breaking of the Malthusian cycle: it was a complex combination of inter-related intellectual, technological, social, economic and moral changes. Historians and economists disagree about the relative importance of each of these elements, and have wrestled with explanations for the primacy of Britain, and Europe more generally, ever since their revolutions began. Allen’s explanation is far from the only one. Scholars will probably never completely agree about what caused the Industrial Revolution. One problem is that this change happened only once, which makes it more difficult for social scientists to explain. Also, the European take-off was probably the result of a combination of scientific, demographic, political, geographic and military factors. Several scholars argue that it was partly due to interactions between Europe and the rest of the world too, not just due to changes within Europe. Historians like Pomeranz tend to focus on peculiarities of time and place. They are more likely to conclude that the Industrial Revolution happened because of a unique combination of favourable circumstances (they may disagree about which ones). Economists like Allen are more likely to look for general mechanisms that can explain success or failure across both time and space. Economists have much to learn from historians, but often a historian’s argument is not precise enough to be testable using a model (the approach we will use in this unit). On the other hand, historians may regard economists’ models as simplistic, ignoring important historical facts. This creative tension is what makes economic history so fascinating. If you want to know what these researchers think of each other’s work, try searching for ‘Gregory Clark review Joel Mokyr’ or ‘Robert Allen review Gregory Clark’. Recently, economic historians have made progress in quantifying economic growth over the very long run. Their work helps clarify what happened, which makes it easier for us to think about why it happened. Some of their work involves comparing real wages in countries over the long run. This has involved collecting both wages and the prices of goods that workers consumed. An even more ambitious series of projects has calculated GDP per capita back to the Middle Ages. We will focus on the economic conditions that contributed to Britain’s take-off, but each economy that broke out of the Malthusian trap took a different escape route. The national trajectories of the early followers were influenced in part by the dominant role that Britain had come to play in the world economy. Germany, for example, could not compete with Britain in textiles, but the government and large banks played a major role in building steel and other heavy industries. Japan outcompeted even Britain in some Asian textile markets, benefiting from the isolation it enjoyed by the sheer distance from the earlier starters (which in those days was weeks of travel). Japan selectively copied both technology and institutions, introducing the capitalist economic system while retaining many traditional Japanese institutions including rule by an emperor, which would last until the Japanese defeat in the Second World War. India and China provide even greater contrasts. China experienced the capitalist revolution when the Communist Party led a transition away from the centrally planned economy, the antithesis of capitalism that the Party itself had implemented. India, by contrast, is the first major economy in history to have adopted democracy, including universal voting rights, prior to its capitalist revolution. One says that we are so rich and they so poor because we are so good and they so bad; that is, we are hardworking, knowledgeable, educated, well governed, efficacious, and productive, and they are the reverse. The other says that we are so rich and they so poor because we are so bad and they so good: we are greedy, ruthless, exploitative, aggressive, while they are weak, innocent, virtuous, abused, and vulnerable. If you think that the Industrial Revolution happened in Europe because of the Protestant Reformation, or the Renaissance, or the scientific revolution, or the development of superior private property rights, or favourable government policies, then you are in the first camp. If you think that it happened because of colonialism, or slavery, or the demands of constant warfare, then you are in the second. To create an effective model we need to distinguish between the essential features of the economy that are relevant to the question we want to answer, which should be included in the model, and unimportant details that can be ignored. Models come in many forms. You have seen three of them already in Figures 1.5, 1.8 and 1.12 in Unit 1. Models come in many forms—and you have seen three of them already in Figures 1.5, 1.8 and 1.12 in Unit 1. For example, Figure 1.12 illustrated that economic interactions involve flows of goods (for example when you buy a washing machine), services (when you purchase haircuts or bus rides), and also people (when you spend a day working for an employer). 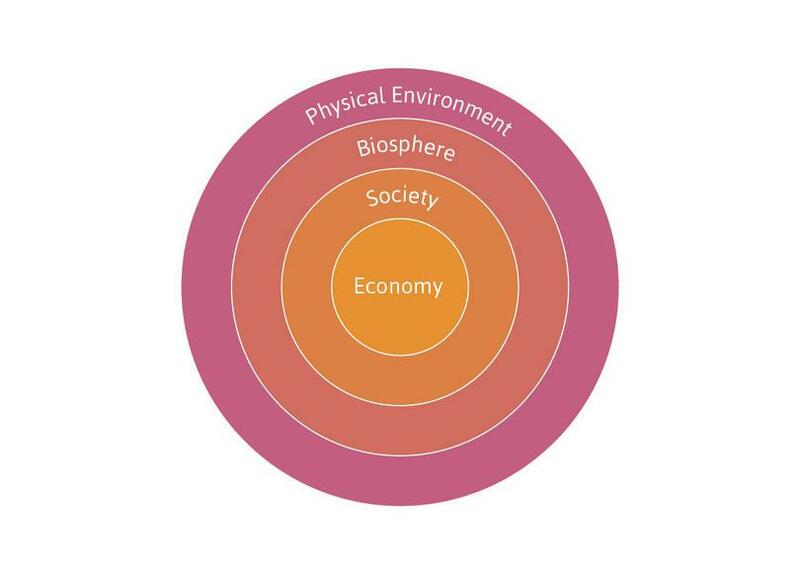 Figure 1.12 was a diagrammatic model illustrating the flows that occur within the economy, and between the economy and the biosphere. The model is not ‘realistic’—the economy and the biosphere don’t look anything like it—but it nevertheless illustrates the relationships among them. The fact that the model omits many details—and in this sense is unrealistic—is a feature of the model, not a bug. Malthus’ explanation of why improvements in technology could not raise living standards was also based on a model: a simple description of the relationships between income and population. Some economists have used physical models to illustrate and explore how the economy works. For his 1891 PhD thesis at Yale University, Irving Fisher designed a hydraulic apparatus (Figure 2.2) to represent flows in the economy. It consisted of interlinked levers and floating cisterns of water to show how the prices of goods depend on the amount of each good supplied, the incomes of consumers, and how much they value each good. The whole apparatus stops moving when the water levels in the cisterns are the same as the level in the surrounding tank. When it comes to rest, the position of a partition in each cistern corresponds to the price of each good. For the next 25 years he would use the contraption to teach students how markets work. Figure 2.2 Irving Fisher’s sketch of his hydraulic model of economic equilibrium (1891). First he built a model to capture the elements of the economy that he thought mattered for the determination of prices. Then he used the model to show how interactions between these elements could result in a set of prices that did not change. Finally he conducted experiments with the model to discover the effects of changes in economic conditions: for example, if the supply of one of the goods increased, what would happen to its price? What would happen to the prices of all of the other goods? Irving Fisher’s doctoral dissertation represented the economy as a big tank of water, but he wasn’t an eccentric inventor. On the contrary, his machine was described by Paul Samuelson, himself one of the greatest economists of the twentieth century, as the ‘greatest doctoral dissertation in economics ever written’. Fisher went on to become one of the most highly regarded economists of the twentieth century, and his contributions formed the basis of modern theories of borrowing and lending that we will describe in Unit 10. Fisher’s machine illustrates an important concept in economics. An equilibrium is a situation that is self-perpetuating, meaning that something of interest does not change unless an outside or external force for change is introduced that alters the model’s description of the situation. Fisher’s hydraulic apparatus represented equilibrium in his model economy by equalizing water levels, which represented constant prices. We will use the concept of equilibrium to explain prices in later units, but we will also apply it to the Malthusian model. An income at subsistence level is an equilibrium because, just like differences in the water levels in the various cisterns in Fisher’s machine, movements away from subsistence income are self-correcting: they automatically lead back to subsistence income as population rises. Note that equilibrium means that one or more things in the model are constant. It does not need to mean that nothing changes. For example, we might see an equilibrium in which GDP or prices are increasing, but at a constant rate. Economic models often use mathematical equations and graphs as well as words and pictures. Mathematics is part of the language of economics, and can help us to communicate our statements about models precisely to others. Much of the knowledge of economics, however, cannot be expressed by using mathematics alone. It requires clear descriptions, using standard definitions of terms. We will use mathematics as well as words to describe models, usually in the form of graphs. If you want, you will also be able to look at some of the equations behind the graphs. Just look for the references to our Leibniz features in the margins. A model starts with some assumptions or hypotheses about how people behave, and often gives us predictions about what we will observe in the economy. Gathering data on the economy, and comparing it with what a model predicts, helps us to decide whether the assumptions we made when we built the model—what to include, and what to leave out—were justified. Bad models can result in disastrous policies, as we will see later. To have confidence in a model, we need to see whether it is consistent with evidence. We will see that our economic models of the vicious circle of Malthusian subsistence living standards and the permanent technological revolution pass this test—even though they leave many questions unanswered. For a country (or city) of your choice, look up a map of the railway or public transport network. Much like economic models, maps are simplified representations of reality. They include relevant information, while abstracting from irrelevant details. How do you think the designer selected which features of reality to include in the map you have selected? In what way is a map not like an economic model? Ceteris paribus and other simplifications help us focus on the variables of interest. We see more by looking at less. Incentives matter, because they affect the benefits and costs of taking one action as opposed to another. Relative prices help us compare alternatives. Economic rent is the basis of how people make choices. Part of the process of learning to do economics involves learning a new language. The terms below will recur frequently in the units that follow, and it is important to learn how to use them precisely and with confidence. As is common in scientific inquiry, economists often simplify an analysis by setting aside things that are thought to be of less importance to the question of interest, by using the phrase ‘holding other things constant’ or, more often, the Latin expression ceteris paribus, meaning ‘other things equal’. For example, later in the course we simplify an analysis of what people would choose to buy by looking at the effect of changing a price—ignoring other influences on our behaviour like brand loyalty, or what others would think of our choices. We ask: what would happen if the price changed, but everything else that might influence the decision was the same. These ceteris paribus assumptions, when used well, can clarify the picture without distorting the key facts. Prices of all inputs are the same for all firms. All firms know the technologies used by other firms. Attitudes towards risk are similar among firm owners. Suppose you build a model of the market for umbrellas, in which the predicted number of umbrellas sold by a shop depends on their colour and price, ceteris paribus. The colour and the price are variables used to predict sales. Which other variables are being held constant? Which of the following questions do you think this model might be able to answer? In each case, suggest improvements to the model that might help you to answer the question. Why are annual umbrella sales higher in the capital city than in other towns? Why are annual umbrella sales higher in some shops in the capital city than others? Why have weekly umbrella sales in the capital city risen over the last six months? Why did the water in Fisher’s hydraulic economy machine move when he changed the quantity of ‘supply’ or ‘demand’ for one or more of the goods, so that the prices were no longer in equilibrium? The analogy to the free movement of water in Fisher’s machine is that people are free to select different courses of action, rather than simply being told what to do. This is where economic incentives affect the choices we make. But we can’t do everything we want to do: not every channel is open to us. Like many economic models, the one we use to explain the permanent technological revolution is based on the idea that people or firms respond to economic incentives. As we will see in Unit 4, people are motivated not only by the desire for material gain but also by love, hate, sense of duty, and desire for approval. But material comfort is an important motive, and economic incentives appeal to this motive. When owners or managers of firms decide how many workers to hire, or when shoppers decide what and how much to buy, prices are going to be an important factor determining their decision. If prices are a lot lower in the discount supermarket than in the corner shop, and it is not too far away, then this will be a good argument for shopping in the supermarket rather than in the shop. Relative prices are simply the price of one option relative to another. We often express relative price as the ratio of two prices. We will see that they matter a lot in explaining not just what shoppers (or consumers, as we usually call them) decide to buy, but why firms make the choices that they do. When we study the Industrial Revolution, you will see that the ratio of energy prices (the price of coal, for example, to power a steam engine), to the wage rate (the price of an hour of a worker’s time) plays an important part in the story. Imagine that you have figured out a new way of reproducing sound in high quality. Your invention is much cheaper to use than anyone else’s method. Your competitors cannot copy you, either because they cannot figure out how to do it or because you have a patent on the process (making it illegal for them to copy you). So they continue offering their services at a price that is much higher than your costs. If you match their price, or undercut them by just a bit, you will be able to sell as much as you can produce, so you can charge the same price but make profits that greatly exceed those of your competitors. In this case, we say that you are making an innovation rent. Innovation rents are a form of economic rent—and economic rents occur throughout the economy. They are one of the reasons why capitalism can be such a dynamic system. We will use the idea of innovation rents to explain some of the factors contributing to the Industrial Revolution. But economic rent is a general concept that will help explain many other features of the economy. When taking some action (call it action A) results in a greater benefit to yourself than the next best action, we say that you have received an economic rent. The term is easily confused with everyday uses of the word, such as the rent for temporary use of a car, apartment, or piece of land. To avoid this confusion, when we mean economic rent, we emphasize the word ‘economic’. Remember, an economic rent is something you would like to get, not something you have to pay. The alternative action with the next greatest net benefit (action B), is often called the ‘next best alternative’, your ‘reservation position’, or the term we use: reservation option. It is ‘in reserve’ in case you do not choose A. Or, if you are enjoying A but then someone excludes you from doing it, your reservation option is your Plan B. This is why it is also called a ‘fallback option’. If action A would give you an economic rent (and nobody else would suffer): Do it! If you are already doing action A, and it earns you an economic rent: Carry on doing it! This decision rule motivates our explanation of why a firm may innovate by switching from one technology to another. We start in the next section by comparing technologies. Which of the following is an economic rent? The amount you pay your landlord for the use of an apartment. The amount you pay to hire a car for a weekend. The extra profit that a successful innovator makes on bringing a new product to the market before its competitors. The extra profit that a firm makes when it doubles in size and there are no changes to costs or the price for each unit of its output. This is the rent as used in everyday language. Economic rent is something you would like to get and not something you have to pay. An economic rent is what you earn above the next best alternative, which in this case may be the additional earnings compared to subletting the land to someone else at the same rate. This particular form of economic rent is called an innovation rent, where profits are made in excess of those offered by the next best alternative due to the adoption of new technology. This would be the normal profit you can earn in return for hard work. An economic rent is what you earn over and above the next best option, for example working really hard in another job. How does a firm evaluate the cost of different technologies? Suppose we ask an engineer to report on the technologies that are available to produce 100 metres of cloth, where the inputs are labour (number of workers, each working for a standard eight-hour day) and energy (tonnes of coal). The answer is represented in the diagram and table in Figure 2.3. The five points in the table represent five different technologies. For example, technology E uses 10 workers and 1 tonne of coal to produce 100 metres of cloth. Follow the steps in Figure 2.3 so you can understand the five technologies. Different technologies for producing 100 metres of cloth. 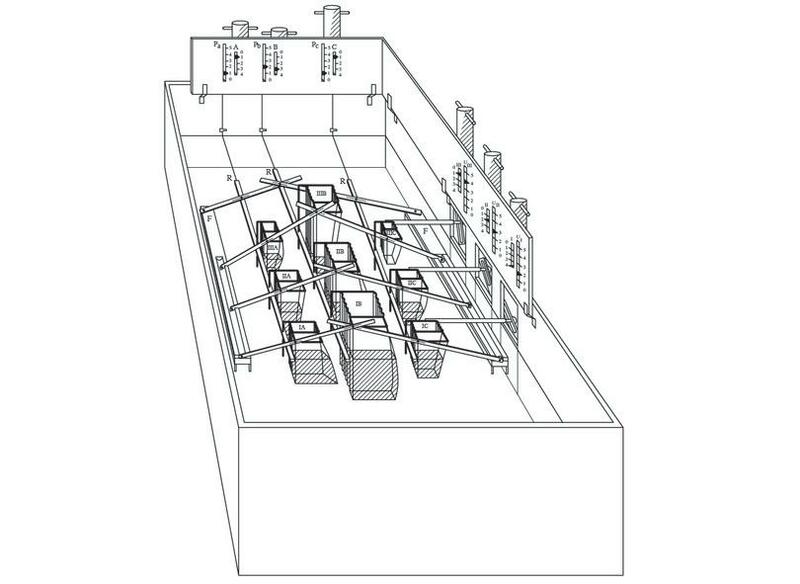 Figure 2.3 Different technologies for producing 100 metres of cloth. The table describes five different technologies that we refer to in the rest of this section. They use different quantities of labour and coal as inputs for producing 100 metres of cloth. Figure 2.3a The table describes five different technologies that we refer to in the rest of this section. They use different quantities of labour and coal as inputs for producing 100 metres of cloth. The A-technology is the most energy-intensive, using 1 worker and 6 tonnes of coal. 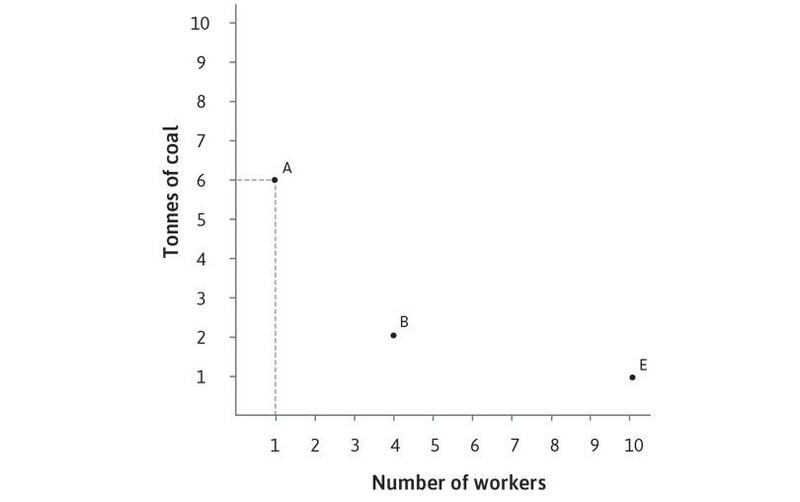 Figure 2.3b The A-technology is the most energy-intensive, using 1 worker and 6 tonnes of coal. The B-technology uses 4 workers and 2 tonnes of coal: it is a more labour-intensive technology than A. 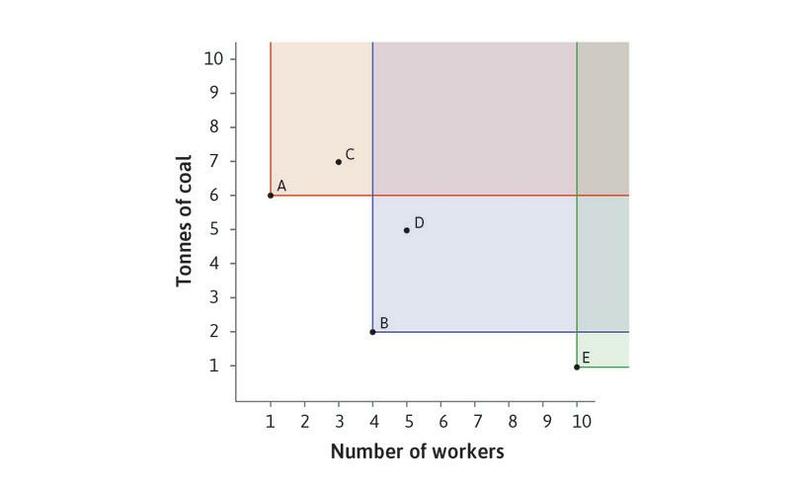 Figure 2.3c The B-technology uses 4 workers and 2 tonnes of coal: it is a more labour-intensive technology than A. The C-technology uses 3 workers and 7 tonnes of coal. Figure 2.3d The C-technology uses 3 workers and 7 tonnes of coal. The D-technology uses 5 workers and 5 tonnes of coal. Figure 2.3e The D-technology uses 5 workers and 5 tonnes of coal. Finally, the E-technology uses 10 workers and 1 tonne of coal. This is the most labour-intensive of the five technologies. Figure 2.3f Finally, the E-technology uses 10 workers and 1 tonne of coal. This is the most labour-intensive of the five technologies. We describe the E-technology as relatively labour-intensive and the A-technology as relatively energy-intensive. If an economy were using technology E and shifted to using technology A or B we would say that they had adopted a labour-saving technology, because the amount of labour used to produce 100 metres of cloth with these two technologies is less than with technology E. This is what happened during the Industrial Revolution. Which technology will the firm choose? The first step is to rule out technologies that are obviously inferior. We begin in Figure 2.4 with the A-technology and look to see whether any of the alternative technologies use at least as much labour and coal. The C-technology is inferior to A: to produce 100 metres of cloth, it uses more workers (three rather than one) and more coal (7 tonnes rather than 6 tonnes). We say the C-technology is dominated by the A-technology: assuming all inputs must be paid for, no firm will use technology C when A is available. The steps in Figure 2.4 show you how to see which of the technologies are dominated, and which technologies dominate. Technology A dominates C; technology B dominates D. The E-technology does not dominate any of the other available technologies. We know this because none of the other four technologies are in the area above and to the right of E.
Figure 2.4 Technology A dominates C; technology B dominates D.
The five technologies for producing 100 metres of cloth are represented by the points A to E. We can use this figure to show which technologies dominate others. Figure 2.4a The five technologies for producing 100 metres of cloth are represented by the points A to E. We can use this figure to show which technologies dominate others. Clearly, technology A dominates the C-technology: the same amount of cloth can be produced using A with fewer inputs of labour and energy. This means that, whenever A is available, you would never use C.
Figure 2.4b Clearly, technology A dominates the C-technology: the same amount of cloth can be produced using A with fewer inputs of labour and energy. This means that, whenever A is available, you would never use C.
Technology B dominates the D-technology: the same amount of cloth can be produced using B with fewer inputs of labour and energy. Note that B would dominate any other technology that is in the shaded area above and to the right of point B. Figure 2.4c Technology B dominates the D-technology: the same amount of cloth can be produced using B with fewer inputs of labour and energy. Note that B would dominate any other technology that is in the shaded area above and to the right of point B. Figure 2.4d Technology A dominates C; technology B dominates D. The E-technology does not dominate any of the other available technologies. We know this because none of the other four technologies are in the area above and to the right of E.
Using only the engineering information about inputs, we have narrowed down the choices: the C- and D-technologies would never be chosen. But how does the firm choose between A, B and E? This requires an assumption about what the firm is trying to do. We assume its goal is to make as much profit as possible, which means producing cloth at the least possible cost. Making a decision about technology also requires economic information about relative prices—the cost of hiring a worker relative to that of purchasing a tonne of coal. Intuitively, the labour-intensive E-technology would be chosen if labour was very cheap relative to the cost of coal; the energy-intensive A-technology would be preferable in a situation where coal is relatively cheap. An economic model helps us be more precise than this. 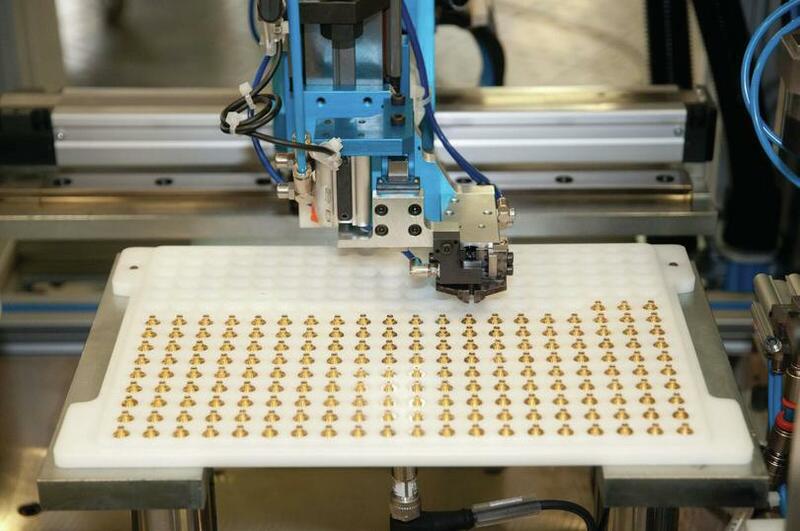 How does a firm evaluate the cost of production using different technologies? Suppose that the wage is £10 and the price of coal is £20 per tonne. In the table in Figure 2.5, we have calculated the cost of employing two workers and three tonnes of coal, which is £80. This corresponds to combination P₁ in the diagram. If the firm were to employ more workers—say, six—but reduce the input of coal to one tonne (point P₂), that would also cost £80. Follow the steps in Figure 2.5 to see how we construct isocost lines to compare the costs of all combinations of inputs. If we look at one isocost line—the £80 one—we can see that all points above the line cost more than £80, and all points below cost less. 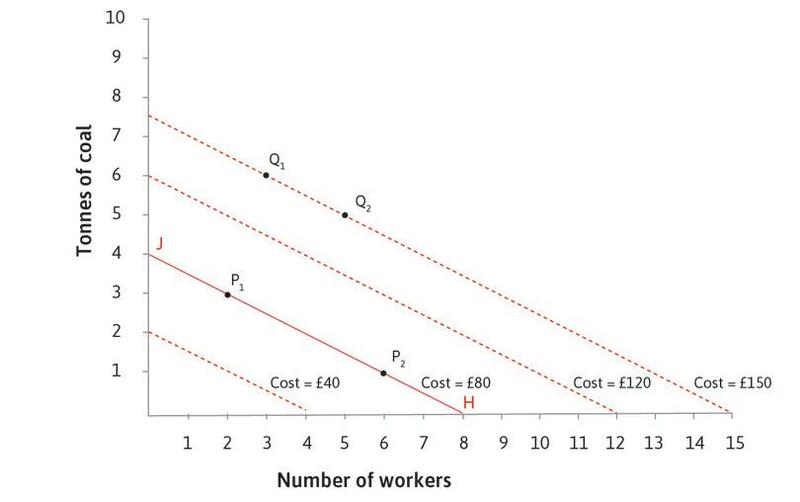 Figure 2.5 Isocost lines when the wage is £10 and the price of coal is £20. The total cost of employing 2 workers with 3 tonnes of coal is (2 × 10) + (3 × 20) = £80. Figure 2.5a The total cost of employing 2 workers with 3 tonnes of coal is (2 × 10) + (3 × 20) = £80. If the number of workers is increased to 6, costing £60, and the input of coal is reduced to 1 tonne, the total cost will still be £80. 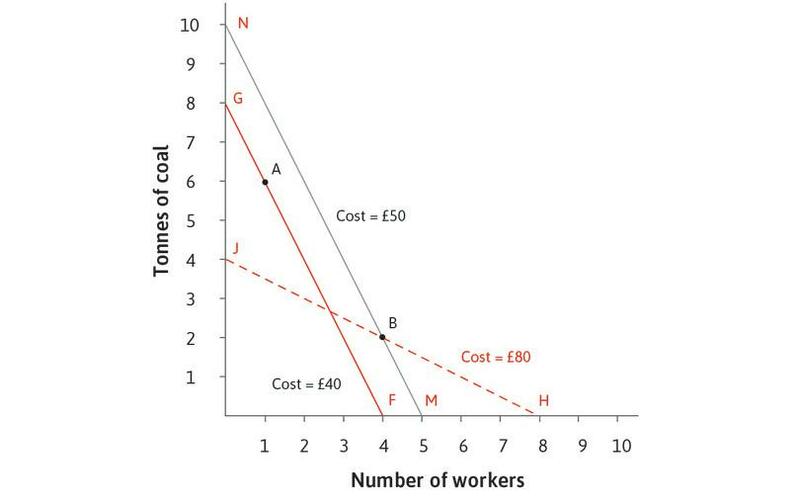 Figure 2.5b If the number of workers is increased to 6, costing £60, and the input of coal is reduced to 1 tonne, the total cost will still be £80. The straight line through P1 and P2 joins together all the points where the total cost is £80. We call this an isocost line: iso is the Greek for ‘same’. When drawing the line, we simplify by assuming that fractions of workers and of coal can be purchased. Figure 2.5c The straight line through P1 and P2 joins together all the points where the total cost is £80. We call this an isocost line: iso is the Greek for ‘same’. When drawing the line, we simplify by assuming that fractions of workers and of coal can be purchased. At point Q1 (3 workers, 6 tonnes of coal) the total cost is £150. 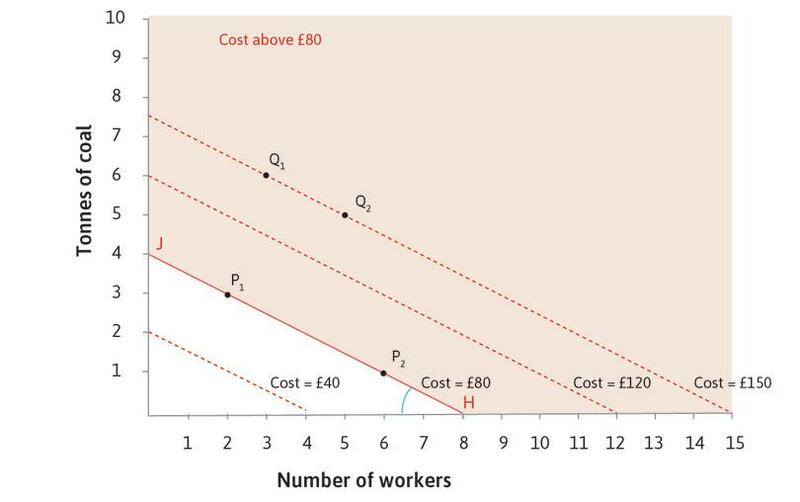 To find the £150 isocost line, look for another point costing £150: if 2 more workers are employed, the input of coal should be reduced by 1 tonne to keep the cost at £150. This is point Q2. 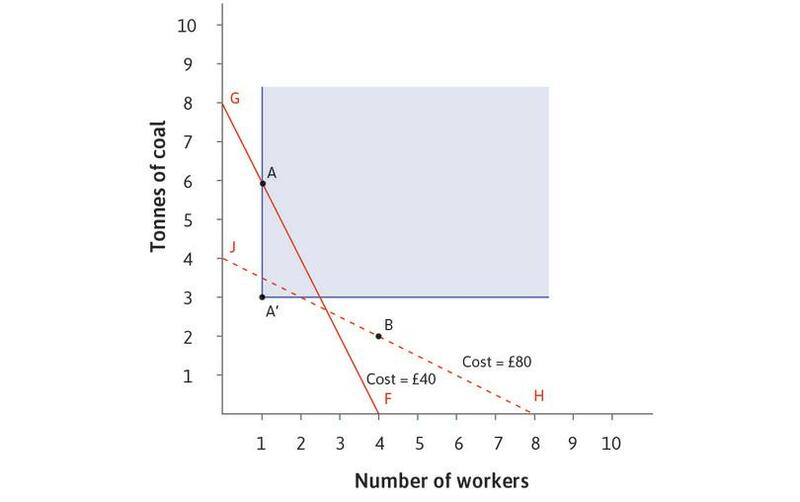 Figure 2.5d At point Q1 (3 workers, 6 tonnes of coal) the total cost is £150. 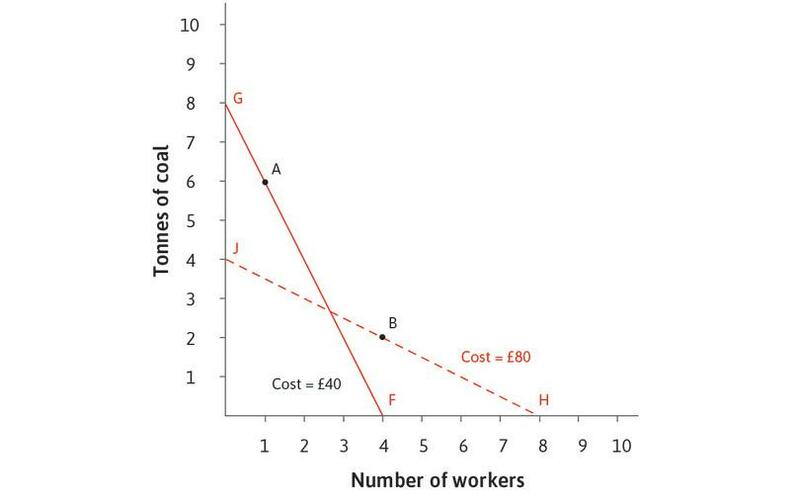 To find the £150 isocost line, look for another point costing £150: if 2 more workers are employed, the input of coal should be reduced by 1 tonne to keep the cost at £130. This is point Q2. We could draw isocost lines through any other set of points in the diagram. If prices of inputs are fixed, the isocost lines are parallel. A simple way to draw any line is to find the end points: for example, the £80 line joins the points J (4 tonnes of coal and no workers) and H (8 workers, no coal). Figure 2.5e We could draw isocost lines through any other set of points in the diagram. If prices of inputs are fixed, the isocost lines are parallel. 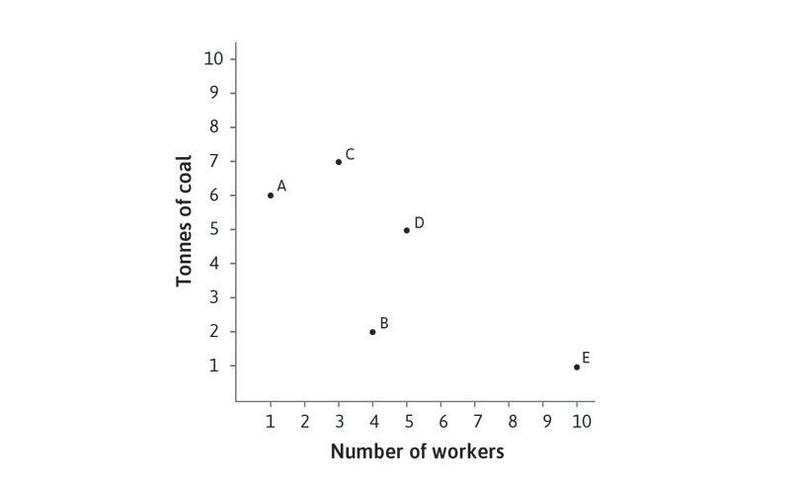 A simple way to draw any line is to find the end points: for example, the £80 line joins the points J (4 tonnes of coal and no workers) and H (8 workers, no coal). The slope of the isocost lines is negative (they slope downward). In this case the slope is −0.5, because at each point, if you hired one more worker, costing £10, and reduced the amount of coal by 0.5 tonnes, saving £10, the total cost would remain unchanged. The slope is equal to −(w/p), the wage divided by the price of coal. Figure 2.5f The slope of the isocost lines is negative (they slope downward). 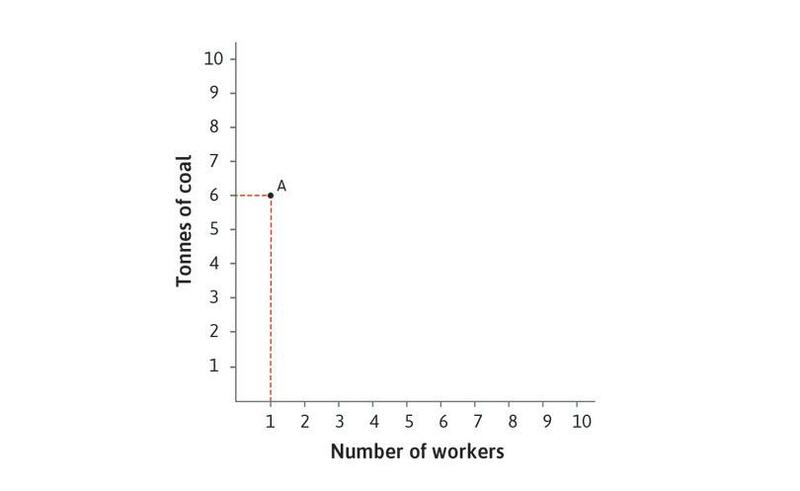 In this case the slope is −0.5, because at each point, if you hired one more worker, costing £10, and reduced the amount of coal by 0.5 tonnes, saving £10, the total cost would remain unchanged. The slope is equal to −(w/p), the wage divided by the price of coal. Figure 2.5g If we look at one isocost line—the £80 one—we can see that all points above the line cost more than £80, and all points below cost less. Isocost lines join all the combinations of workers and coal that cost the same amount. We can use them to help us compare the costs of the three technologies A, B, and E that remain in play (that is, are not dominated). The table in Figure 2.6 shows the cost of producing 100 metres of cloth with each technology when the wage is £10 and the price of coal is £20. Clearly the B-technology allows the firm to produce cloth at lower cost. In the diagram, we have drawn the isocost line through the point representing technology B. This shows immediately that, at these input prices (remember that the wage is the ‘price’ of labour), the other two technologies are more costly. The cost of using different technologies to produce 100 metres of cloth: Low relative cost of labour. Figure 2.6 The cost of using different technologies to produce 100 metres of cloth: Low relative cost of labour. 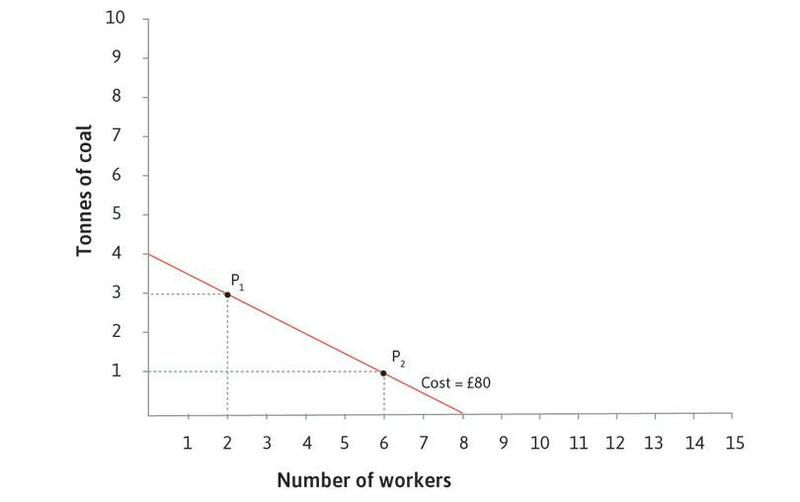 We can see from Figure 2.6 that B is the least-cost technology when w = 10 and p = 20. The other available technologies will not be chosen at these input prices. Notice that it is the relative price that matters and not the absolute price: if both prices doubled, the diagram would look almost the same: the isocost line through B would have the same slope, although the cost would be £160. This is one way to write the equation of the isocost line for any value of c.
where a, which is a constant, is the vertical axis intercept and b is the slope of the line. In our model, tonnes of coal, R, are on the vertical axis, the number of workers, L, is on the horizontal axis and we shall see that the slope of the line is the wage relative to the price of coal, −(w/p). The isocost line slopes downward so the slope term in the equation −(w/p) is negative. So when w = 10 and p = 20, the isocost line for c = 80 has a vertical axis intercept of 80/20 = 4 and a negative slope equal to −(w/p) = −1/2. The slope is the relative price of labour. Suppose the wage is £10 but the price of coal is only £5. What is the relative price of labour? Using the method in the text, write down the equation of the isocost line for c = £60, and rewrite it in the standard form y = a + bx. Write the equations for the £30 and £90 isocost lines in the standard form too, and draw all three lines on a diagram. How does the set of isocost lines for these input prices compare to the ones for w = 10 and p = 20? We have seen that when the wage is £10 and the price of coal is £20, B is the least-cost technology. Any change in the relative price of these two inputs will change the slope of the isocost lines. Looking at the positions of the three technologies in Figure 2.7, we can imagine that if the isocost line becomes sufficiently steep (with the wage rising relative to the cost of coal), B will no longer be the least-cost technology: the firm will switch to A. This is what happened in England in the eighteenth century. Let’s look at how a change in relative prices could cause this to happen. Suppose that the price of coal falls to £5 while the wage remains at £10. Looking at the table in Figure 2.7, with the new prices, the A-technology allows the firm to produce 100 metres of cloth at least cost. Cheaper coal makes each method of production cheaper, but the energy-intensive technology is now cheapest. The slope of the isocost line can be found by calculating the relative price of labour. It is equal to –(10/5) = −2. If you spent £10 on labour by hiring an extra worker, you could reduce coal by 2 tonnes and keep the total cost at £40. Figure 2.7 The cost of using different technologies to produce 100 metres of cloth: high relative cost of labour. 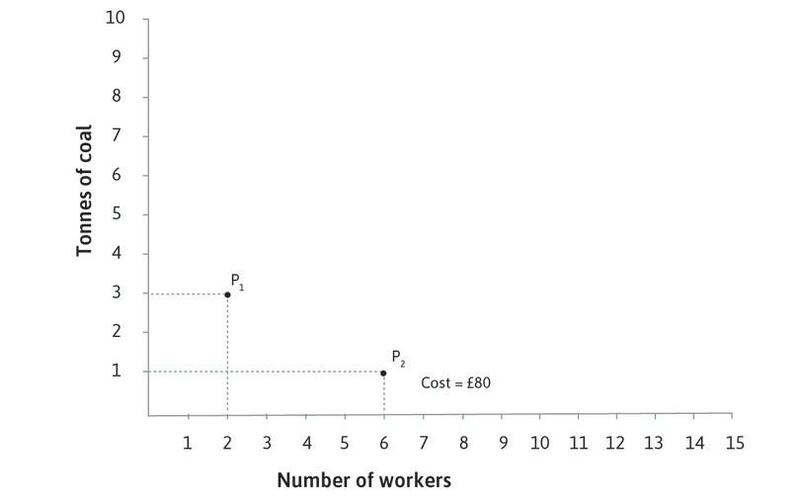 When the wage is £10 and the price of coal is £5, the table shows that the A-technology, which is more energy-intensive than the others, can produce 100 metres of cloth at a lower cost than B or E.
Figure 2.7a The cost of using different technologies to produce 100 metres of cloth: high relative cost of labour. The A-technology is on the isocost line FG. At any point on this line, the total cost of inputs is £40. Technologies B and E are above this line, with higher costs. Figure 2.7b The cost of using different technologies to produce 100 metres of cloth: high relative cost of labour. The slope of the isocost line can be found by calculating the relative price of labour. It is equal to −(10/5) = −2. If you spent £10 on labour by hiring an extra worker, you could reduce coal by 2 tonnes and keep the total cost at £40. Figure 2.7c The cost of using different technologies to produce 100 metres of cloth: high relative cost of labour. Remember that to draw the isocost line through any point, such as A, we calculate the cost at A (£40) then look for another point with the same cost. The easiest way is to find one of the end points F or G. For example, if no coal was used, four workers could be hired for £40. This is point F.
You can see from Figure 2.7 that with the new relative price the A-technology lies on the £40 isocost line, and the other two available technologies lie above it. They will not be chosen if the A-technology is available. How does a cost-reducing innovation raise the profits of the firm? The next step is to calculate the gains to the first firm to adopt the least-cost technology (A) when the relative price of labour to coal rises. Like all its competitors, the firm is initially using the B-technology and minimizing its costs: this is shown in Figure 2.8 by the dashed isocost line through B (with end points H and J). Once the relative prices change, the new isocost line through the B-technology is steeper and the cost of production is £50. Switching to the A-technology (which is more energy-intensive and less labour-intensive) to produce 100 metres of cloth reduces costs to £40. Follow the steps in Figure 2.8 to see how isocost lines change with the new relative prices. At the new relative prices, the B-technology is on the isocost line MN, where the cost is £50. Switching to technology A will be cheaper. Figure 2.8 The cost of using different technologies to produce 100 metres of cloth. 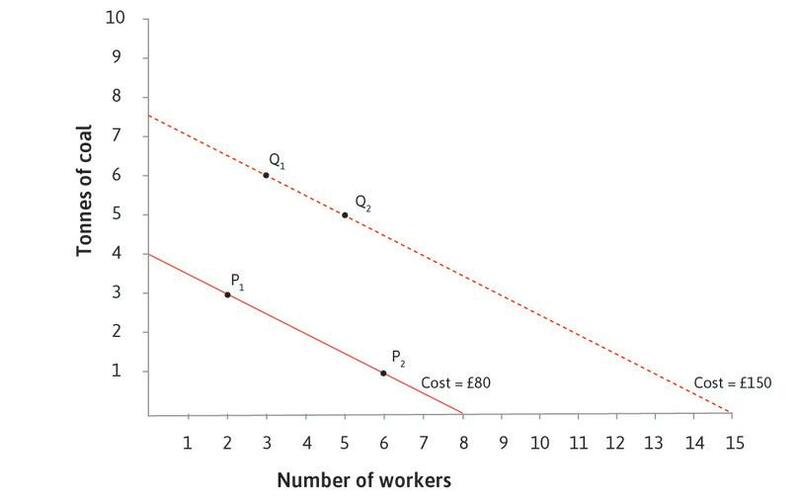 When the wage is £10 and the price of coal is relatively high at £20, the cost of producing 100 metres of cloth using technology B is £80: choosing the B-technology puts the firm on the HJ isocost curve. Figure 2.8a The cost of using different technologies to produce 100 metres of cloth. 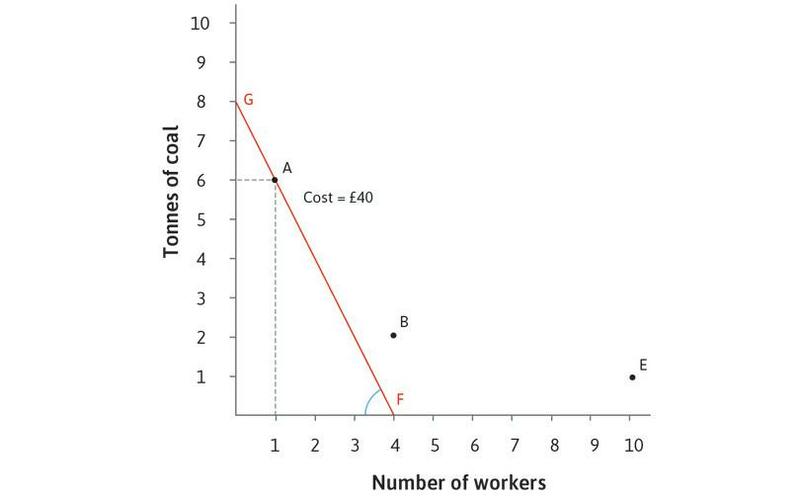 If the price of coal falls relative to the wage as shown by the isocost curve FG, then using the A-technology, which is more energy-intensive than B, costs £40. From the table, we see that with these relative prices, A is now the least-cost technology. Figure 2.8b The cost of using different technologies to produce 100 metres of cloth. Figure 2.8c The cost of using different technologies to produce 100 metres of cloth. The firm’s profits are equal to the revenue it gets from selling output minus its costs. In this case, the economic rent for a firm switching from B to A is £10 per 100 metres of cloth, which is the cost reduction made possible by the new technology. The decision rule (if the economic rent is positive, do it!) tells the firm to innovate. In our example, the A-technology was available, but not in use until a first-adopter firm responded to the incentive created by the increase in the relative price of labour. The first adopter is called an entrepreneur. When we describe a person or firm as entrepreneurial, it refers to a willingness to try out new technologies and to start new businesses. 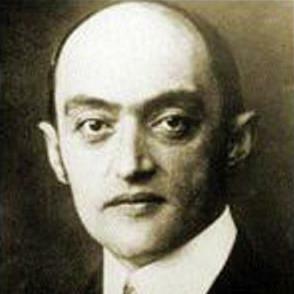 The economist Joseph Schumpeter (see below) made the adoption of technological improvements by entrepreneurs a key part of his explanation for the dynamism of capitalism. This is why innovation rents are often called Schumpeterian rents. Innovation rents will not last forever. Other firms, noticing that entrepreneurs are making economic rents, will eventually adopt the new technology. They will also reduce their costs and their profits will increase. In this case, with higher profits per 100 metres of cloth, the lower-cost firms will thrive. They will increase their output of cloth. As more firms introduce the new technology, the supply of cloth to the market increases and the price will start to fall. This process will continue until everyone is using the new technology, at which stage prices will have declined to the point where no one is earning innovation rents. The firms that stuck to the old B-technology will be unable to cover their costs at the new lower price for cloth, and they will go bankrupt. Joseph Schumpeter called this creative destruction. Figure 2.3 shows different technologies for producing 100 metres of cloth. From the graph, what can we conclude? Technology D is more energy-intensive than technology C.
Technology B dominates technology D.
Technology A is the cost-minimizing technology at all prices of coal and wages. Technology C can sometimes be a cheaper technology than A. 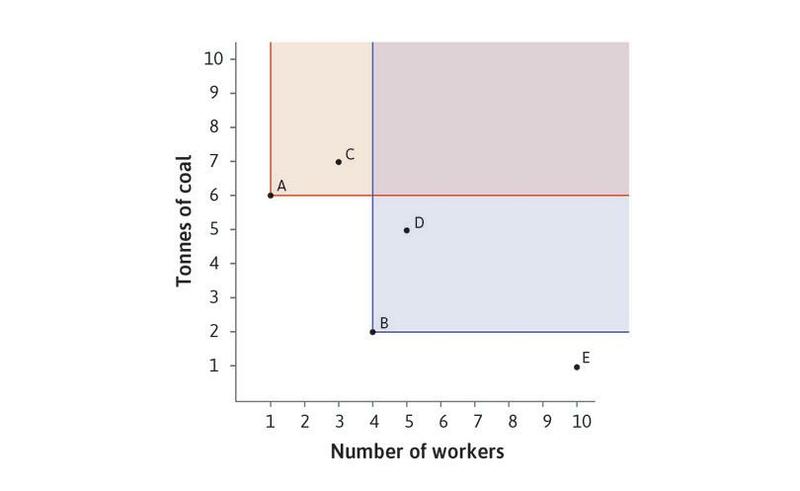 Technology D uses more workers and less coal, and therefore is more labour-intensive than C.
Technology B uses fewer workers and fewer tonnes of coal than technology D to produce the same amount of cloth, so it dominates D.
Technology A would be costlier than B, D or E if the price of coal were much higher than the wage level. 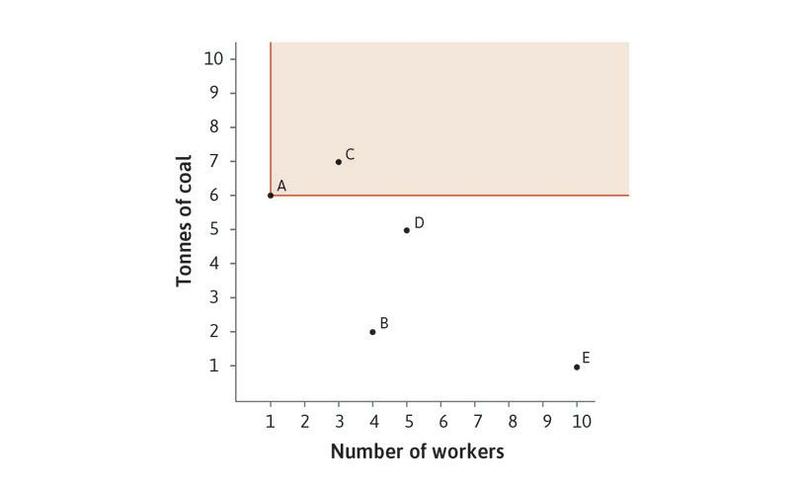 Technology C is dominated by A as it uses both more workers and more coal than A. Therefore it can never be a cheaper technology than A. Look at the three isocost lines in Figure 2.8. Based on this information, what can we conclude? When the wage is £10 and the price of coal is £5, the combination of inputs at point N is more costly than the inputs at point B.
Isocosts MN and FG represent the same price ratio (wage/price of coal) but different total costs of production. Isocost HJ represents a higher (wage/price of coal) ratio than isocost FG. Isocost HJ represents all points that can produce 100 metres of cloth at a particular price ratio. At these prices, N and B are on the same isocost line. These two combinations of inputs cost the same. The price ratio is equal to the slope of an isocost; since isocosts MN and FG have the same slope, we can infer that they represent the same price ratio. MN is higher than FG, so represents higher total costs. Isocost FG has a slope of -2 (replacing two tonnes of coal with one worker leaves the total cost of production the same), while isocost HJ has slope -0.5 (replacing one tonne of coal with two workers leaves the total cost the same). 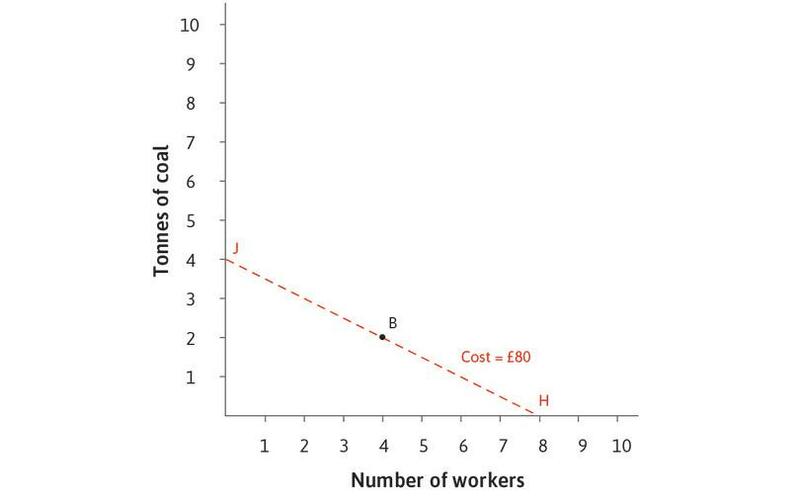 This means that labour is relatively cheaper along HJ, or isocost HJ has a lower wage/price of coal ratio. An isocost represents all combinations of workers and tonnes of coal for which the total cost of production is the same. Along isocost HJ we know that at point B (4 workers and 2 tonnes of coal) the technology can produce 100 metres of cloth. If a technology were available to produce at another point on the line it would not necessarily produce 100 metres of cloth. Lynne Kiesling, a historian of economic thought, discusses Joseph Schumpeter. Schumpeter brought to economics the idea of the entrepreneur as the central actor in the capitalist economic system. The entrepreneur is the agent of change who introduces new products, new methods of production, and opens up new markets. Imitators follow, and the innovation is diffused through the economy. A new entrepreneur and innovation launch the next upswing. For Schumpeter, creative destruction was the essential fact about capitalism: old technologies and the firms that do not adapt are swept away by the new, because they cannot compete in the market by selling goods at a price that covers the cost of production. The failure of unprofitable firms releases labour and capital goods for use in new combinations. Schumpeter was born in Austro-Hungary, but migrated to the US after the Nazis won the election in 1932 that led to the formation of the Third Reich in 1933. He had also experienced the First World War and the Great Depression of the 1930s, and died while writing an essay called ‘The march into socialism’, recording his concerns about the increasing role of government in the economy and the resulting ‘migration of people’s economic affairs from the private into the public sphere’. As a young professor in Austria he had fought and won a duel with the university librarian to ensure that students had access to books. He also claimed that as a young man he had three ambitions in life: to become the world’s greatest economist, the world’s greatest lover, and the world’s greatest horseman. He added that only the decline of the cavalry had stopped him from succeeding in all three. Before the Industrial Revolution, weaving, spinning, and making clothes for the household were time-consuming tasks for most women. Single women were known as ‘spinsters’ because spinning was their primary occupation. Eve Fisher, a historian, calculated that making a shirt at this time required 500 hours of spinning, and 579 hours of work in total—costing $4,197.25 at today’s minimum wage in the US. What did inventions such as the spinning jenny do? The first spinning jennies had eight spindles. One machine operated by just one adult therefore replaced eight spinsters working on eight spinning wheels. By the late nineteenth century, a single spinning mule operated by a very small number of people could replace more than 1,000 spinsters. These machines did not rely on human energy, but were powered first by water wheels, and later by coal-powered steam engines. 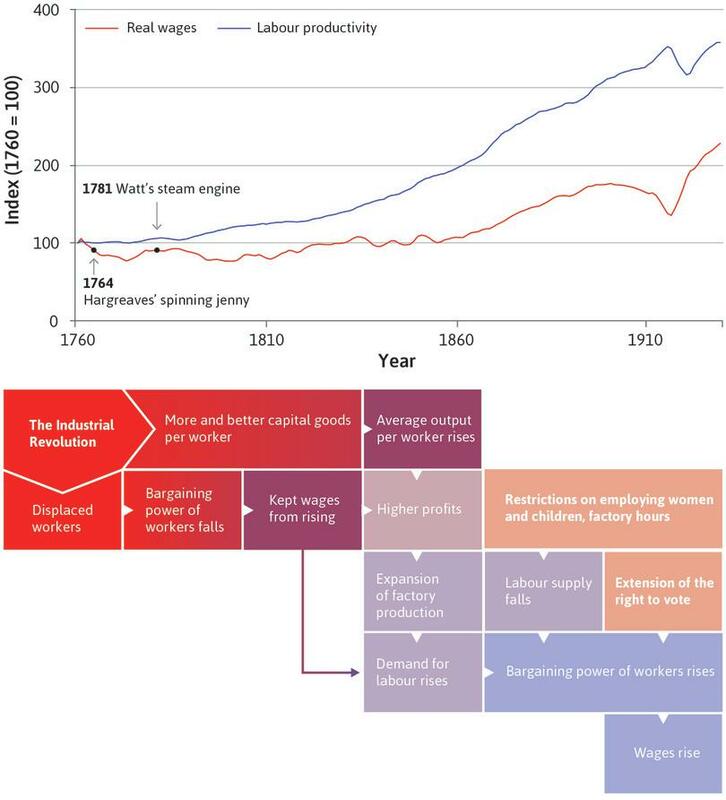 Figure 2.9 summarizes these changes that happened in the Industrial Revolution. The change in spinning technology during the Industrial Revolution. Figure 2.9 The change in spinning technology during the Industrial Revolution. The model in the previous section provides a hypothesis (potential explanation) for why someone would bother to invent such a technology, and why someone would want to use it. In this model, producers of cloth chose between technologies using just two inputs—energy and labour. This is a simplification, but it shows the importance of the relative costs of inputs for the choice of technology. When the cost of labour increased relative to the cost of energy, there were innovation rents to be earned from a switch to the energy-intensive technology. This is just a hypothesis. Is it actually what happened? Looking at how relative prices differed among countries, and how they changed over time, can help us understand why technologies such as the spinning jenny were invented in Britain rather than elsewhere, and in the eighteenth century rather than at an earlier time. Wages relative to the price of energy (early 1700s). Figure 2.10 Wages relative to the price of energy (early 1700s). Page 140 of Robert C. Allen. 2008. The British Industrial Revolution in Global Perspective. Cambridge: Cambridge University Press. Figure 2.10 shows the price of labour relative to the price of energy in various cities in the early 1700s—specifically, the wages of building labourers divided by the price of 1 million BTU (British Thermal Units, a unit of energy equivalent to slightly more than 1,000 joules). 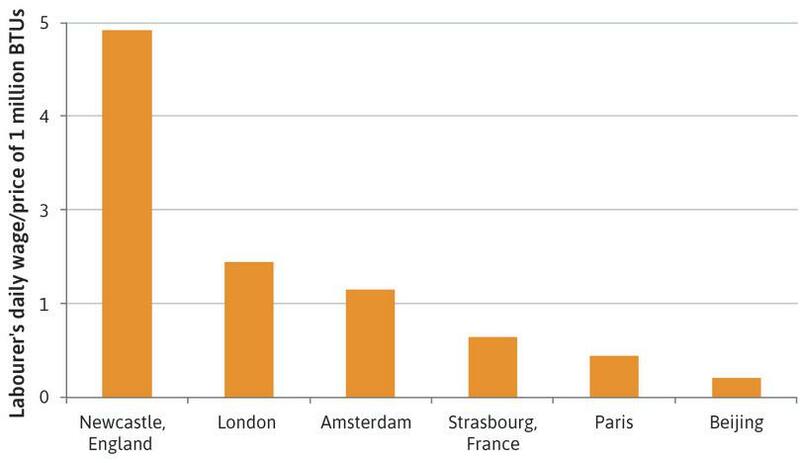 You can see that labour was more expensive relative to the cost of energy in England and the Netherlands than in France (Paris and Strasbourg), and much more so than in China. Wages relative to the cost of energy were high in England, both because English wages were higher than wages elsewhere, and because coal was cheaper in coal-rich Britain than in the other countries in Figure 2.10. Wages relative to the cost of capital goods (late sixteenth to the early nineteenth century). Figure 2.11 Wages relative to the cost of capital goods (late sixteenth to the early nineteenth century). Page 138 in Robert C. Allen. 2008. 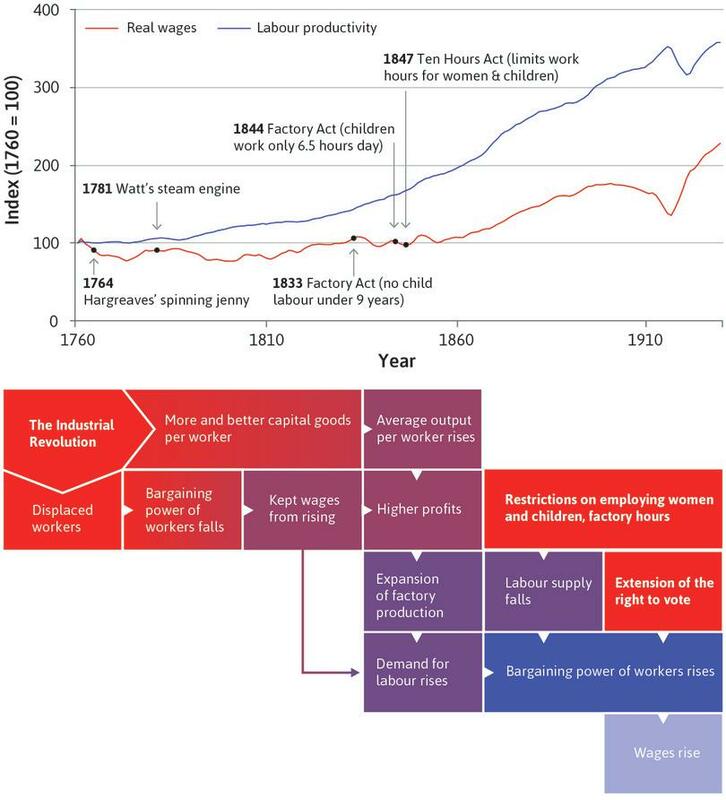 The British Industrial Revolution in Global Perspective. Cambridge: Cambridge University Press. Figure 2.11 shows trends in the cost of labour relative to the cost of capital goods in England and France, from the late sixteenth to the early nineteenth century. It shows the wages of building labourers divided by the cost of using capital goods. This cost is calculated from the prices of metal, wood, and brick, the cost of borrowing, and takes account of the rate at which the capital goods wear out, or depreciate. As you can see, wages relative to the cost of capital goods were similar in England and France in the mid-seventeenth century but from then on, in England but not in France, workers became steadily more expensive relative to capital goods. In other words, the incentive to replace workers with machines was increasing in England during this time, but this was not true in France. In France, the incentive to save labour by innovating had been stronger during the late sixteenth century than it was 200 years later, at the time the Industrial Revolution began to transform Britain. Wages relative to the cost of energy and capital goods rose in the eighteenth century in Britain compared with earlier historical periods. Wages relative to the cost of energy and capital goods were higher in Britain during the eighteenth century than elsewhere. No doubt it helped, too, that Britain was such an inventive country. There were many skilled workmen, engineers and machine makers who could build the machines that inventors designed. The cost of using different technologies to produce 100 metres of cloth in Britain in the seventeenth and eighteenth centuries. Figure 2.12 The cost of using different technologies to produce 100 metres of cloth in Britain in the seventeenth and eighteenth centuries. In the 1600s, the relative prices are shown by isocost line HJ. The B-technology was used. At those relative prices, there was no incentive to develop a technology like A, which is outside the isocost line HJ. Figure 2.12b In the 1600s, the relative prices are shown by isocost line HJ. The B-technology was used. At those relative prices, there was no incentive to develop a technology like A, which is outside the isocost line HJ. In the 1700s, the isocost lines such as FG were much steeper, because the relative price of labour to coal was higher. The relative cost was sufficiently high to make the A-technology lower cost than the B-technology. Figure 2.12c In the 1700s, the isocost lines such as FG were much steeper, because the relative price of labour to coal was higher. The relative cost was sufficiently high to make the A-technology lower cost than the B-technology. Why is technology A lower cost? We know that when the relative price of labour is high, technology A is lower cost because the B-technology lies outside the isocost line FG. 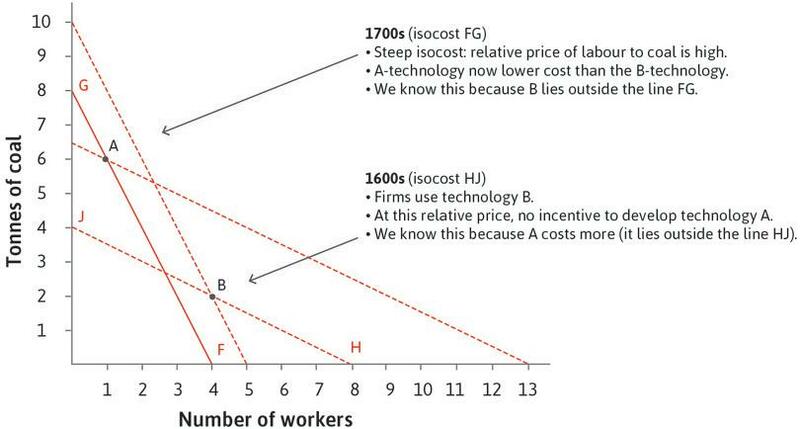 Figure 2.12d We know that when the relative price of labour is high, technology A is lower cost because the B-technology lies outside the isocost line FG. Economic historian Bob Allen addresses the question of why Britain industrialized when others did not. 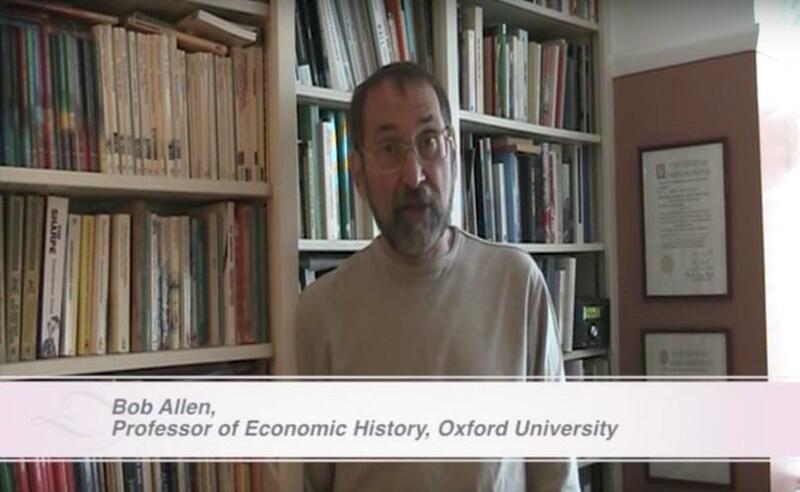 Watch our video in which Bob Allen, an economic historian, explains his theory of why the Industrial Revolution occurred when and where it did. Summarize Allen’s claim using the concept of economic rents. Which ceteris paribus assumptions are you making? What other important factors may explain the rise of energy-intensive technologies in Britain in the eighteenth century? The relative prices of labour, energy and capital can help to explain why the labour-saving technologies of the Industrial Revolution were first adopted in England, and why at that time technology advanced more rapidly there than on the continent of Europe, and even more rapidly compared with Asia. What explains the eventual adoption of these new technologies in countries like France and Germany, and ultimately China and India? One answer is further technological progress, where a new technology is developed that dominates the existing one in use. Technological progress would mean that it would take smaller quantities of inputs to produce 100 metres of cloth. We can use the model to illustrate this. In Figure 2.13, technological progress leads to the invention of a superior energy-intensive technology, labelled A′. The analysis in Figure 2.13 shows that once the A′-technology is available, it would be chosen both in countries using A, and in those using B. The A′ technology is cheaper than both A and B, both in countries where wages are relatively high (isocost line FG) and in low-wage, expensive-energy economies (isocost line HJ). The new labour- and energy-saving technology, A′, is inside FG and HJ, so it will be adopted in both economies. Figure 2.13 The cost of using different technologies to produce 100 metres of cloth. Where the relative price of labour is high, the energy-intensive technology, A, is chosen. Where the relative price of labour is low, the labour-intensive technology, B, is chosen. Figure 2.13a Where the relative price of labour is high, the energy-intensive technology, A, is chosen. Where the relative price of labour is low, the labour-intensive technology, B, is chosen. Improvements in cloth-making technology occur, resulting in a new technology, labelled A′. This technology uses only half as much energy per worker to produce 100 metres of cloth. The new technology dominates the A-technology. Figure 2.13b Improvements in cloth-making technology occur, resulting in a new technology, labelled A′. This technology uses only half as much energy per worker to produce 100 metres of cloth. The new technology dominates the A-technology. Figure 2.13c The A′ technology is cheaper than both A and B, both in countries where wages are relatively high (isocost line FG) and in low-wage, expensive-energy economies (isocost line HJ). The new labour- and energy-saving technology, A′, is inside FG and HJ, so it will be adopted in both economies. Nevertheless, in some countries we still observe the use of technologies that were replaced in Britain during the Industrial Revolution. The model predicts that the relative price of labour must be very low in such situations, making the isocost line very flat. The B-technology could be preferred in Figure 2.13 even when the A′-technology is available if the isocost line is flatter than HJ, so that it goes through B but below A′. 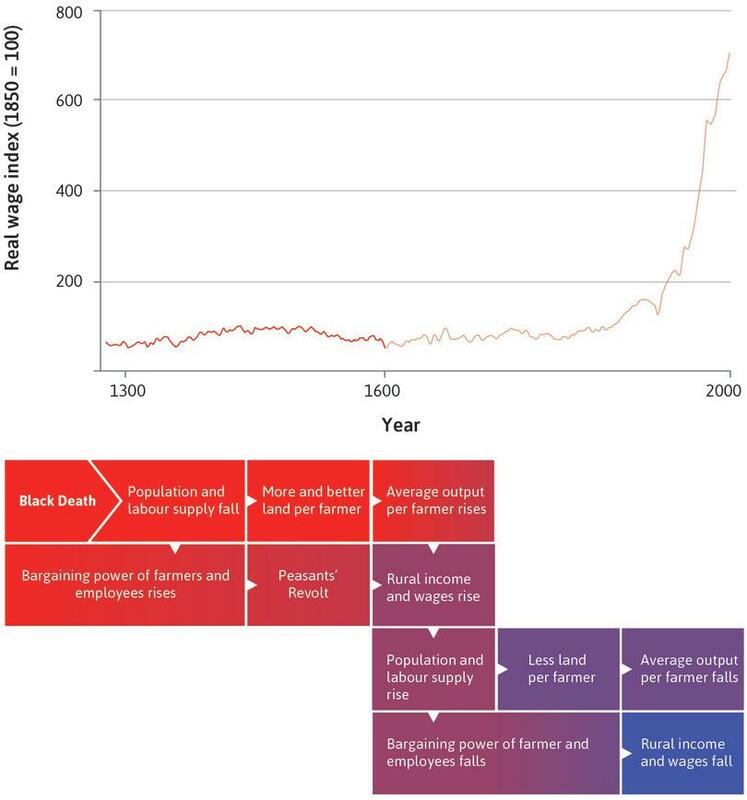 Look again at Figure 2.12 which depicts isocost lines for the 1600s and the 1700s in Britain. 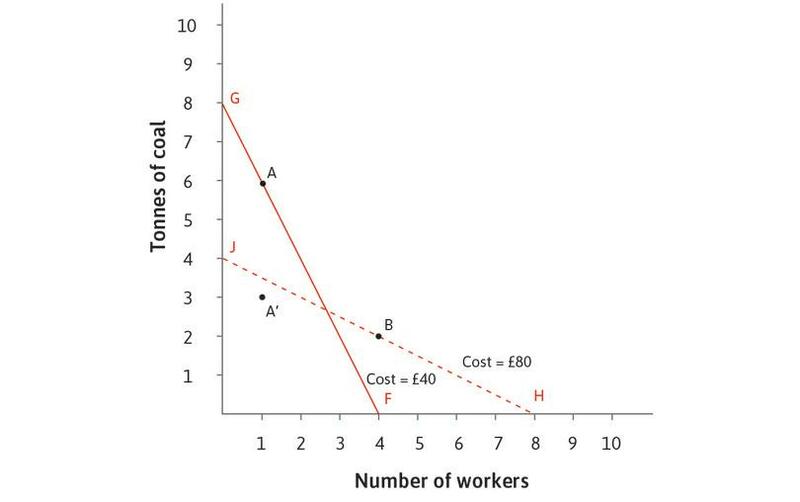 The flatter isocost line HJ for 1600s Britain indicates higher wages relative to the price of coal. The increase in wages relative to the cost of energy in the 1700s is represented by the outward shift of the isocost line from HJ to the parallel isocost line going through A. Had the wage level fallen together with the falling energy costs (due for example to cheaper transportation), then 1700s Britain would definitely have stayed with technology B. The comparison between isocost line FG and the parallel isocost going through B suggests that an innovation rent was earned in 1700s Britain when firms moved from technology B to A. The slope of the isocost line is the negative of the price ratio, −(wage/price of coal). A flatter isocost line indicates lower wages relative to the price of coal. An increase in the level of wages relative to the cost of energy would lead to a steeper isocost line. The relative price matters, not the absolute level. So if wages fall, but by relatively less than the energy costs so that the price ratio still increases, then technology A may still be the better choice. The comparison between these two lines shows that that the cost of producing is lower at A than at B. Therefore, firms adopting technology A enjoy some profit in excess of that which they earned with the alternative: an innovation rent. Exercise 2.5 Why did the Industrial Revolution not happen in Asia? Read David Landes’ answer to this question, and this summary of research on the great divergence to discuss why the Industrial Revolution happened in Europe rather than in Asia, and in Britain rather than in Continental Europe. Which arguments do you find most persuasive, and why? Which arguments do you find least persuasive, and why? This is part of the explanation of the upward kink in the hockey stick. Explaining the long flat part of the stick is another story, requiring a different model. Malthus provided a model of the economy that predicts a pattern of economic development consistent with the flat part of the GDP per capita hockey stick from Figure 1.1a in Unit 1. His model introduces concepts that are used widely in economics. One of the most important concepts is the idea of diminishing average product of a factor of production. To understand what this means, imagine an agricultural economy that produces just one good, grain. Suppose that grain production is very simple—it involves only farm labour, working on the land. In other words, ignore the fact that grain production also requires spades, combine harvesters, grain elevators, silos, and other types of buildings and equipment. Labour and land (and the other inputs that we are ignoring) are called factors of production, meaning inputs into the production process. In the model of technological change above, the factors of production are energy and labour. This describes the relationship between the amount of output produced and the amounts of inputs used to produce it. To understand what will happen when the population grows and there are more farmers on the same limited space of farmland, we need something that economists call the production function for farming. This indicates the amount of output produced by any given number of farmers working on a given amount of land. In this case, we are holding constant all of the other inputs, including land, so we only consider how output varies with the amount of labour. In the previous sections, you have already seen very simple production functions that specified the amounts of labour and energy necessary to produce 100 metres of cloth. 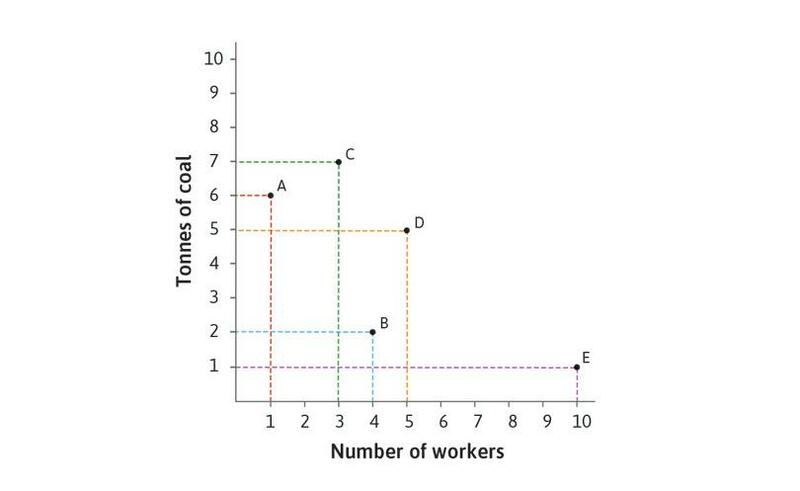 For example, in Figure 2.3, the production function for technology B says that if 4 workers and 2 tonnes of coal are put into production, 100 metres of cloth will be the output. The production function for technology A gives us another ‘if-then’ statement: if 1 worker and 6 tonnes of coal are put into production using this technology, then 100 metres of cloth will be the output. The grain production function is a similar ‘if-then’ statement, indicating that if there are X farmers, then they will harvest Y grain. Figure 2.14a lists some values of labour input and the corresponding grain production. In the third column we have calculated the average product of labour. In Figure 2.14b, we draw the function, assuming that the relationship holds for all farmers and grain production amounts in between those shown in the table. We say that ‘Y is a function of X’. X in this case is the amount of labour devoted to farming. Y is the output in grain that results from this input. The function f(X) describes the relationship between X and Y, represented by the curve in the figure. Recorded values of a farmer’s production function: Diminishing average product of labour. Figure 2.14a Recorded values of a farmer’s production function: Diminishing average product of labour. The farmers’ production function: Diminishing average product of labour. Figure 2.14b The farmers’ production function: Diminishing average product of labour. The production function shows how the number of farmers working the land translates into grain produced at the end of the growing season. Figure 2.14ba The production function shows how the number of farmers working the land translates into grain produced at the end of the growing season. Point A on the production function shows the output of grain produced by 800 farmers. 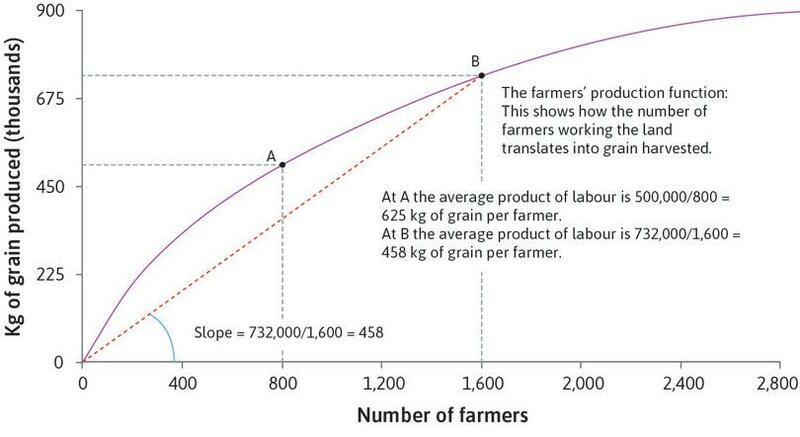 Figure 2.14bb Point A on the production function shows the output of grain produced by 800 farmers. Point B on the production function shows the amount of grain produced by 1,600 farmers. Figure 2.14bc Point B on the production function shows the amount of grain produced by 1,600 farmers. At A, the average product of labour is 500,000 ÷ 800 = 625 kg of grain per farmer. At B, the average product of labour is 732,000 ÷ 1,600 = 458 kg of grain per farmer. Figure 2.14bd At A, the average product of labour is 500,000 ÷ 800 = 625 kg of grain per farmer. At B, the average product of labour is 732,000 ÷ 1,600 = 458 kg of grain per farmer. The slope of the ray from the origin to point B on the production function shows the average product of labour at point B. The slope is 458, meaning an average product of 458 kg per farmer when 1,600 farmers work the land. Figure 2.14be The slope of the ray from the origin to point B on the production function shows the average product of labour at point B. The slope is 458, meaning an average product of 458 kg per farmer when 1,600 farmers work the land. The slope of the ray to point A is steeper than to point B. When only 800 farmers work the land there is a higher average product of labour. The slope is 625, the average product of 625 kg per farmer that we calculated previously. Figure 2.14bf The slope of the ray to point A is steeper than to point B. When only 800 farmers work the land there is a higher average product of labour. The slope is 625, the average product of 625 kg per farmer that we calculated previously. In Unit 1 we explained that the economy is part of the biosphere. Think of farming biologically. Find out how many calories a farmer burns, and how many calories are contained in 1 kg of grain. Does farming produce a surplus of calories—more calories in the output than used up in the work input—using the production function in Figure 2.14b? Labour combined with land is productive. No surprises there. The more farmers there are, the more grain is produced; at least up to a certain point (3,000 farmers, in this case). As more farmers work on a fixed amount of land, the average product of labour falls. This diminishing average product of labour is one of the two foundations of Malthus’ model. Remember that the average product of labour is the grain output divided by the amount of labour input. From the production function in Figure 2.14b, or the table in Figure 2.14a (both show the same information) we see that an annual input of 800 farmers working the land brings an average per-farmer output of 625 kg of grain, while increasing the labour input to 1,600 farmers produces an average output per farmer of 458 kg. The average product of labour falls as more labour is expended on production. This worried Malthus. To see why he was worried, imagine that, a generation later, each farmer has had many children, so that instead of a single farmer working each farm, there are now two farmers working. The total labour input into farming was 800, but is now 1,600. Instead of a harvest of 625 kg of grain per farmer, the average harvest is now only 458 kg. You might argue that in the real world, as the population grows, more land can be used for farming. But Malthus pointed out that earlier generations of farmers would have picked the best land, so any new land would be worse. This also reduces the average product of labour. Because the average product of labour diminishes as more labour is devoted to farming, their incomes inevitably fall. Look again at Figure 2.14b which depicts the production function of grain for farmers under average growing conditions with the currently available technology. In a year with exceptionally good weather conditions, the production function curve will be higher and parallel to the curve above. A discovery of new high-yielding crop seeds would tilt the production function curve higher, pivoted anti-clockwise at the origin. In a year of bad drought, the production curve can slope downwards for large numbers of farmers. If there is an upper limit on the amount of grain that can be produced, then the curve will end up horizontal for large numbers of farmers. Zero farmers means zero output. Therefore, all curves must start at the origin, and cannot shift upwards or downwards in a parallel manner. Such a discovery would increase the kilogrammes of grain produced for any given number of farmers (except zero); this can be represented graphically as an anti-clockwise pivot in the production function curve. A downward-sloping curve implies decreasing output as the number of farmers increases. This would only be the case if the additional labourers have negative effects on the productivity of the existing labourers, which we normally rule out. 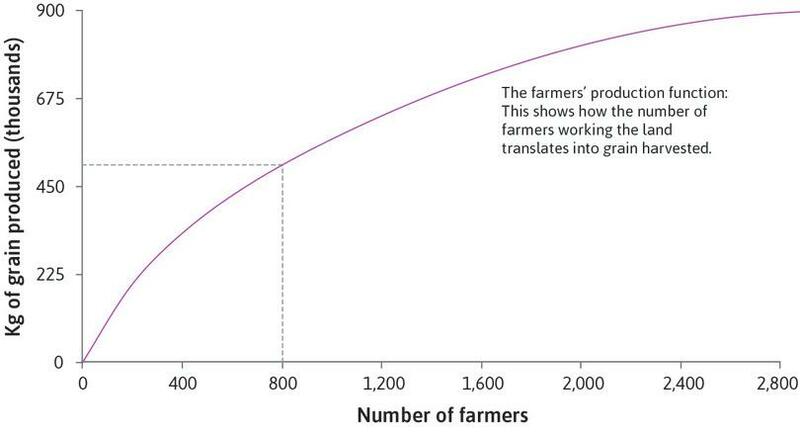 An upper limit implies that additional farmers would not yield any additional kilogrammes of grain, which would be represented graphically by a flat production function past the upper limit. On its own, the diminishing average product of labour does not explain the long, flat portion of the hockey stick. It just means that living standards depend on the size of the population. It doesn’t say anything about why, over long periods, living standards and population didn’t change much. For this we need the other part of Malthus’s model: his argument that increased living standards create a population increase. Imagine a herd of antelopes on a vast and otherwise empty plain. Imagine also that there are no predators to complicate their lives (or our analysis). When the antelopes are better fed, they live longer and have more offspring. When the herd is small, the antelopes can eat all they want, and the herd gets larger. Eventually the herd will get so large relative to the size of the plain that the antelopes can no longer eat all they want. As the amount of land per animal declines, their living standards will start to fall. This reduction in living standards will continue as long as the herd continues to increase in size. Since each animal has less food to eat, the antelopes will have fewer offspring and die younger so population growth will slow down. Eventually, living standards will fall to the point where the herd is no longer increasing in size. The antelopes have filled up the plain. At this point, each animal will be eating an amount of food that we will define as the subsistence level. When the animals’ living standards have been forced down to subsistence level as a result of population growth, the herd is no longer getting bigger. If antelopes eat less than the subsistence level, the herd starts to get smaller. And when consumption exceeds the subsistence level, the herd grows. Much of the same logic would apply, Malthus reasoned, to a human population living in a country with a fixed supply of agricultural land. While people are well-fed they would multiply like Cantillon’s mice in a barn; but eventually they would fill the country, and further population growth would push down the incomes of most people as a result of diminishing average product of labour. Falling living standards would slow population growth as death rates increased and birth rates fell; ultimately incomes would settle at the subsistence level. If conditions change, then population and incomes may change too, but eventually the economy will return to an equilibrium with income at subsistence level. Exercise 2.7 Are people really like other animals? Do you agree? Explain your reasoning. We know that over the centuries before the Industrial Revolution, improvements in technology occurred in many regions of the world, including Britain, and yet living standards remained constant. Can Malthus’ model explain this? 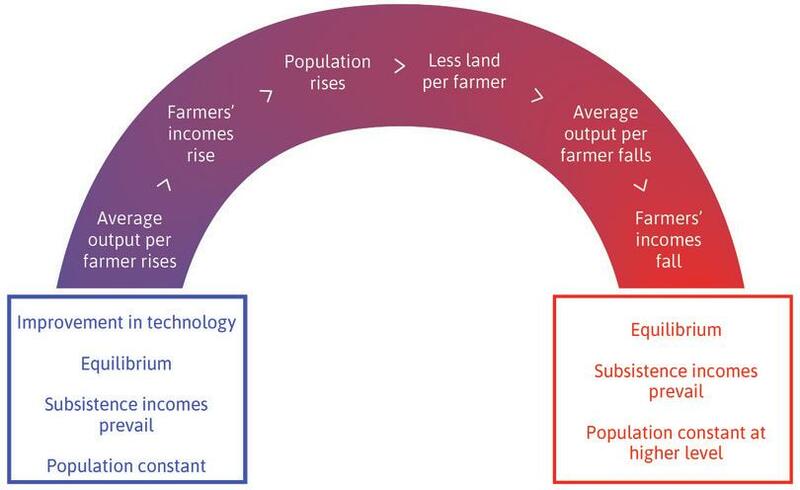 Figure 2.15 illustrates how the combination of diminishing average product of labour and the effect of higher incomes on population growth mean that in the very long run, technological improvements will not result in higher income for farmers. In the figure, things on the left are causes of things to the right. Malthus’ model: The effect of an improvement in technology. 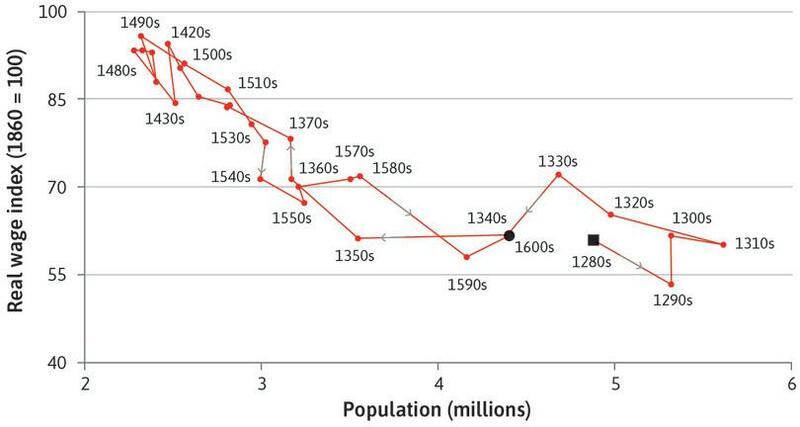 Figure 2.15 Malthus’ model: The effect of an improvement in technology. Beginning from equilibrium, with income at subsistence level, a new technology such as an improved seed raises income per person on the existing fixed quantity of land. Higher living standards lead to an increase in population. As more people are added to the land, diminishing average product of labour means average income per person falls. Eventually incomes return to subsistence level, with a higher population. Why is the population higher at the new equilibrium? Output per farmer is now higher for each number of farmers. Population does not fall back to the original level, because income would be above subsistence. A better technology can provide subsistence income for a larger population. The Einstein at the end of this section shows how to represent Malthus’ model graphically, and how to use it to investigate the effect of a new technology. Then in the long run, an increase in productivity will result in a larger population but not higher wages. This depressing conclusion was once regarded as so universal and inescapable that it was called Malthus’ Law. Malthus’s argument is summarized in Figure 2.16, using two diagrams. 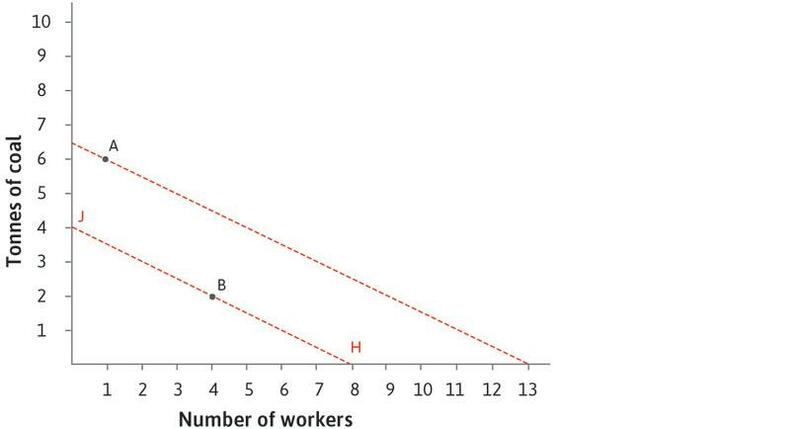 The downward-sloping line in the left-hand figure shows that the higher the population, the lower the level of wages, due to the diminishing average product of labour. The upward-sloping line on the right shows the relationship between wages and population growth. When wages are high, population grows, because higher living standards lead to more births and fewer deaths. Figure 2.16 A Malthusian economy. At a medium population level, the wage of people who work the land is at subsistence level (point A). The wage is higher at point B, where the population is smaller, because the average product of labour is higher. Figure 2.16a At a medium population level, the wage of people who work the land is at subsistence level (point A). The wage is higher at point B, where the population is smaller, because the average product of labour is higher. The line in the right-hand diagram slopes upward, showing that when wages (on the vertical axis) are high, population growth (on the horizontal axis) is positive (so the population will rise). When wages are low, population growth is negative (population falls). 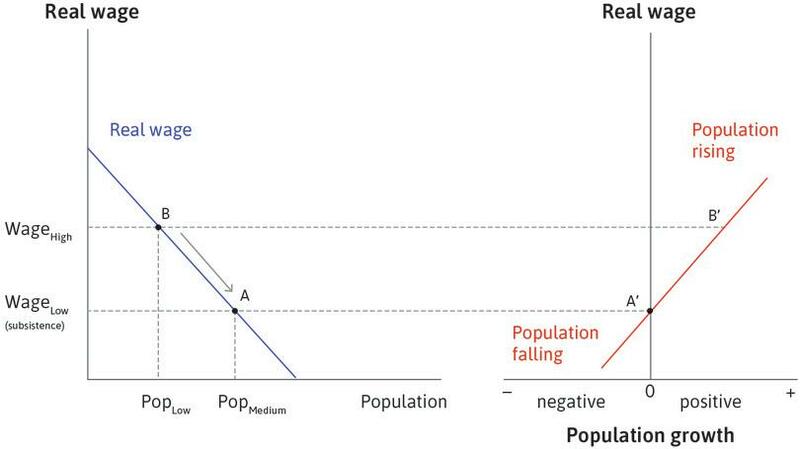 Figure 2.16b The line in the right-hand diagram slopes upward, showing that when wages (on the vertical axis) are high, population growth (on the horizontal axis) is positive (so the population will rise). When wages are low, population growth is negative (population falls). At point A, on the left, population is medium-sized and the wage is at subsistence level. Tracing across to point A′ on the right shows that population growth is equal to zero. So if the economy is at point A, it is in equilibrium: population stays constant and wages remain at subsistence level. Figure 2.16c At point A, on the left, population is medium-sized and the wage is at subsistence level. Tracing across to point A′ on the right shows that population growth is equal to zero. So if the economy is at point A, it is in equilibrium: population stays constant and wages remain at subsistence level. Suppose the economy is at B, with a higher wage and lower population. Point B′, on the right, shows that the population will be rising. 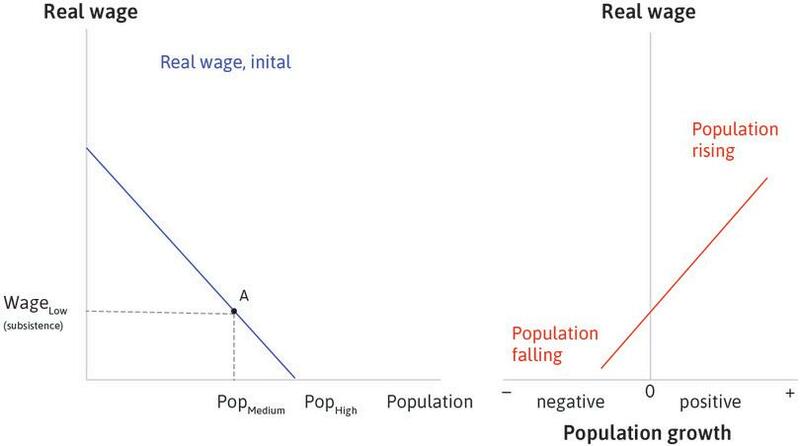 Figure 2.16d After a plague, for example, the economy is at B, with a higher wage and lower population. Point B′, on the right, shows that the population will be rising. As the population rises, the economy moves down the line in the left diagram: wages fall until they reach equilibrium at A. Figure 2.16e As the population rises, the economy moves down the line in the left diagram: wages fall until they reach equilibrium at A. The two diagrams together explain the Malthusian population trap. Population will be constant when the wage is at subsistence level, it will rise when the wage is above subsistence level, and it will fall when the wage is below subsistence level. Figure 2.17 shows how the Malthusian model predicts that even if productivity increases, living standards in the long run do not. Introduction of a new technology in a Malthusian economy. The introduction of a new technology in a Malthusian economy. Figure 2.17 The introduction of a new technology in a Malthusian economy. The economy starts at point A, with a medium-sized population and wage at subsistence level. 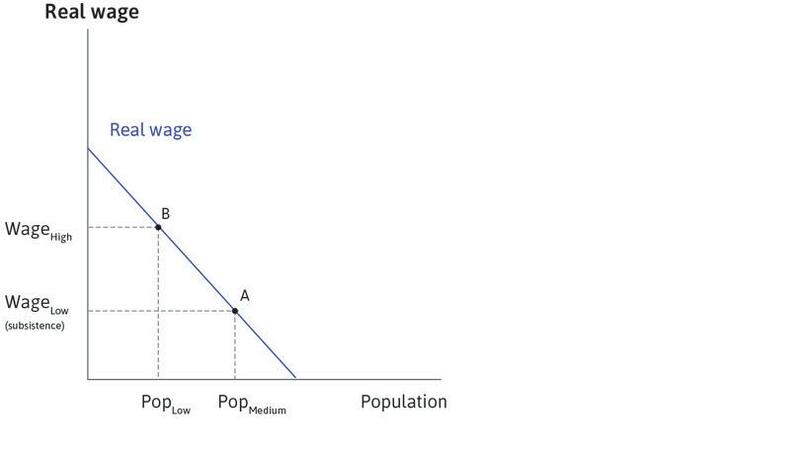 Figure 2.17a The economy starts at point A, with a medium-sized population and wage at subsistence level. A technological improvement (for example, better seeds) raises the average product of labour, and the wage is higher for any level of population. The real wage line shifts upward. At the initial population level, the wage increases and the economy moves to point D.
Figure 2.17b A technological improvement (for example, better seeds) raises the average product of labour, and the wage is higher for any level of population. The real wage line shifts upward. At the initial population level, the wage increases and the economy moves to point D.
At point D, the wage has risen above subsistence level and therefore the population starts to grow (point D′). Figure 2.17c At point D, the wage has risen above subsistence level and therefore the population starts to grow (point D′). As population rises, the wage falls, due to the diminishing average product of labour. The economy moves down the real-wage curve from D.
Figure 2.17d As population rises, the wage falls, due to the diminishing average product of labour. The economy moves down the real-wage curve from D.
At C, the wage has reached subsistence level again. The population remains constant (point C′). The population is higher at equilibrium C than it was at equilibrium A. Figure 2.17e At C, the wage has reached subsistence level again. The population remains constant (point C′). The population is higher at equilibrium C than it was at equilibrium A. Imagine that the population growth curve in the right panel of Figure 2.16 shifted to the left (with fewer people being born, or more people dying, at any level of wages). Explain what would happen to living standards describing the transition to the new equilibrium. The major long-run impact of better technology in this Malthusian world was therefore more people. The writer H. G. Wells, author of War of the Worlds, wrote in 1905 that humanity ‘spent the great gifts of science as rapidly as it got them in a mere insensate multiplication of the common life’. So we now have a possible explanation of the long, flat portion of the hockey stick. Human beings periodically invented better ways of making things, both in agriculture and in industry, and this periodically raised the incomes of farmers and employees above subsistence. The Malthusian interpretation was that higher real wages led young couples to marry earlier and have more children, and they also led to lower death rates. Population growth eventually forced real wages back to subsistence levels, which might explain why China and India, with relatively sophisticated economies at the time, ended up with large populations but—until recently—very low incomes. As with our model of innovation rents, relative prices and technological improvements, we need to ask: can we find evidence to support the central prediction of the Malthusian model, that incomes will return to subsistence level? Figure 2.18 is consistent with what Malthus predicted. From the end of the thirteenth century to the beginning of the seventeenth century, Britain oscillated between periods of higher wages, leading to larger populations, leading to lower wages, leading to smaller populations, leading to … and so on, a vicious circle. We get a different view of the vicious circle by taking Figure 2.18 and focusing on the period between 1340 and 1600, shown in Figure 2.19. As a result of the outbreak of bubonic plague known as the Black Death, from 1349 to 1351 between a quarter and a third of Europe’s population died. The lower part of the figure shows the causal linkages that led to the effects we see in the top part. The Malthusian trap: Wages and population (1280–1600). Figure 2.18 The Malthusian trap: Wages and population (1280–1600). Robert C. Allen. 2001. ‘The Great Divergence in European Wages and Prices from the Middle Ages to the First World War’. Explorations in Economic History 38 (4): pp. 411–447. 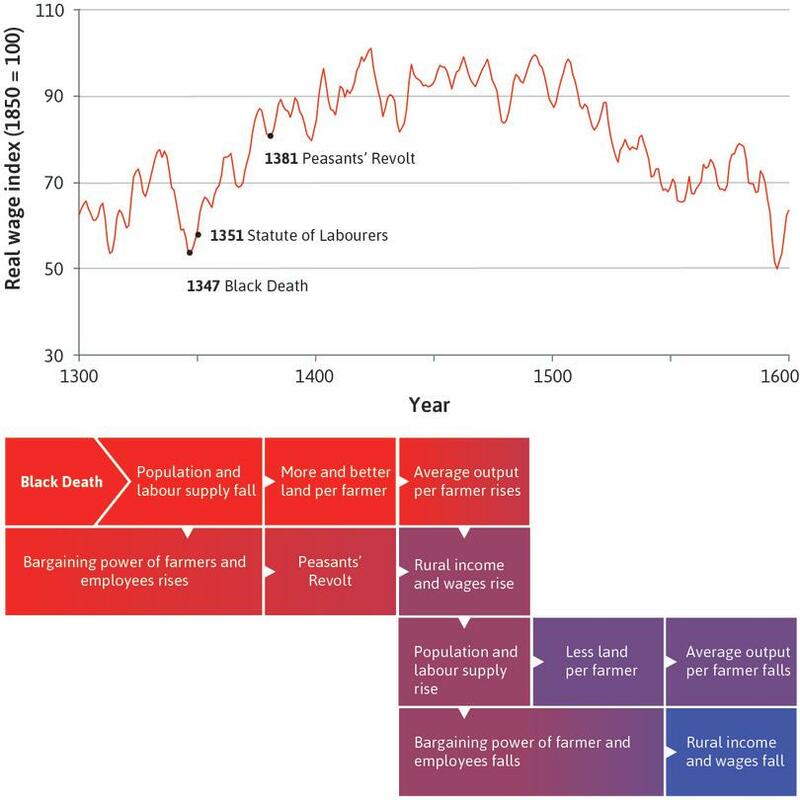 The Black Death, labour supply, politics, and the wage: A Malthusian economy. 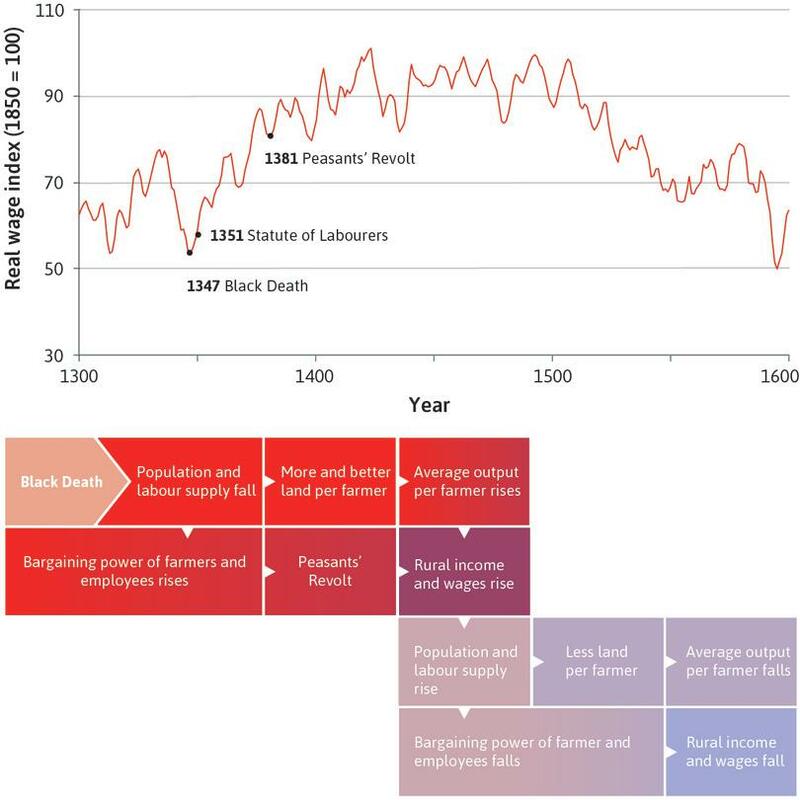 Figure 2.19 The Black Death, labour supply, politics, and the wage: A Malthusian economy. In this figure, we examine the Malthusian economy that existed in England between the years 1300 and 1600, highlighted above. Figure 2.19a In this figure, we examine the Malthusian economy that existed in England between the years 1300 and 1600, highlighted above. The bubonic plague of 1348–50 was known as the Black Death. It killed 1.5 million people out of an estimated English population of 4 million, leading to a dramatic fall in labour supply. Figure 2.19b The bubonic plague of 1348–50 was known as the Black Death. It killed 1.5 million people out of an estimated English population of 4 million, leading to a dramatic fall in labour supply. This decline in the population had an economic benefit for the farmers and workers who survived: it meant that farmers had more and better land, and workers could demand higher wages. Incomes rose as the plague abated. 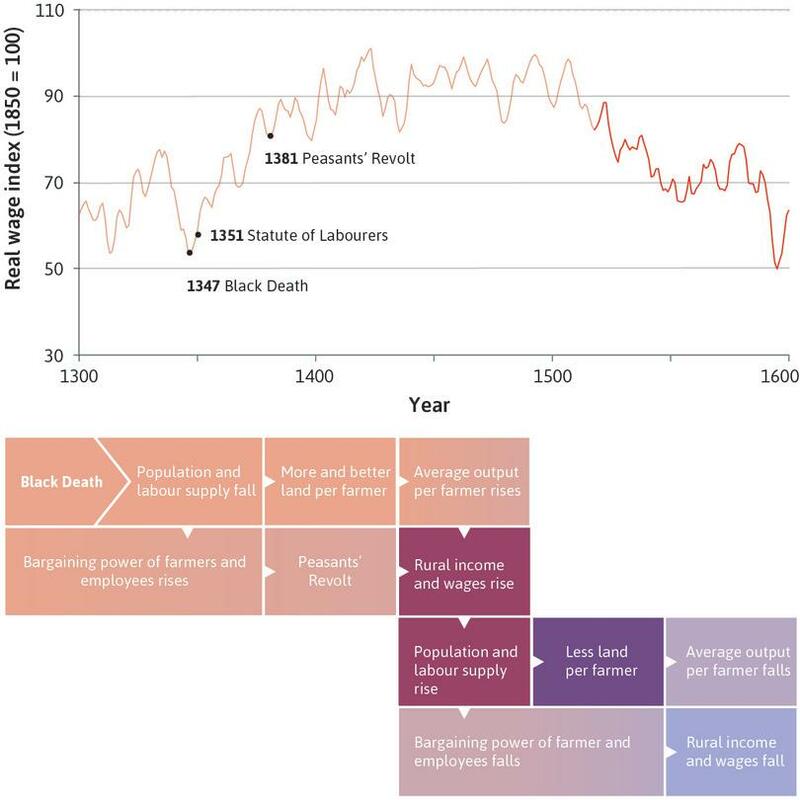 Figure 2.19c This decline in the population had an economic benefit for the farmers and workers who survived: it meant that farmers had more and better land, and workers could demand higher wages. Incomes rose as the plague abated. In 1351, King Edward III of England tried to limit wage rises by law, helping to cause a period of rebellions against authority, notably the Peasants’ Revolt of 1381. Despite the King’s actions, incomes continued to increase. Figure 2.19d In 1351, King Edward III of England tried to limit wage rises by law, helping to cause a period of rebellions against authority, notably the Peasants’ Revolt of 1381. Despite the King’s actions, incomes continued to increase. By the middle of the fifteenth century, the real wages of English building workers had doubled. Increased wages helped the population to recover in the sixteenth century, but Malthus’ law asserted itself: as the population increased, incomes fell. Figure 2.19e By the middle of the fifteenth century, the real wages of English building workers had doubled. Increased wages helped the population to recover in the sixteenth century, but Malthus’ law asserted itself: as the population increased, incomes fell. By 1600, real wages had fallen to the level they were 300 years previously. Figure 2.19f By 1600, real wages had fallen to the level they were 300 years previously. Our model of Malthusian economics helps to explain the rise and fall of incomes between 1300 and 1600 in England. 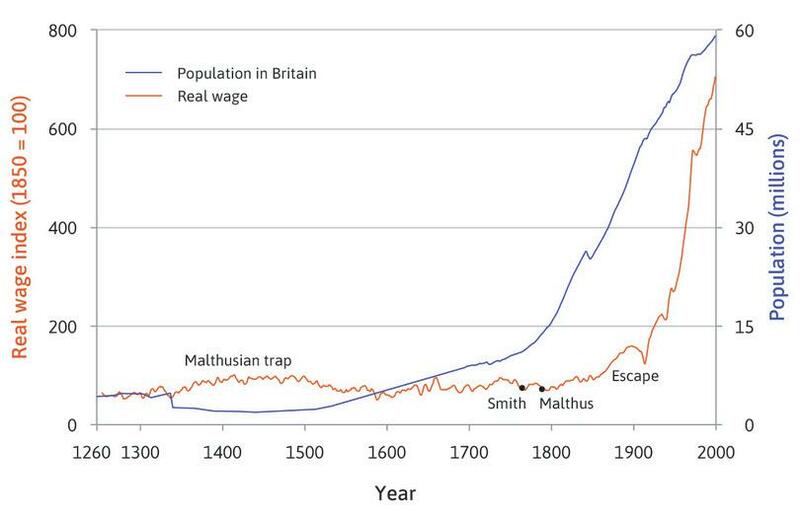 Figure 2.19g Our model of Malthusian economics helps to explain the rise and fall of incomes between 1300 and 1600 in England. 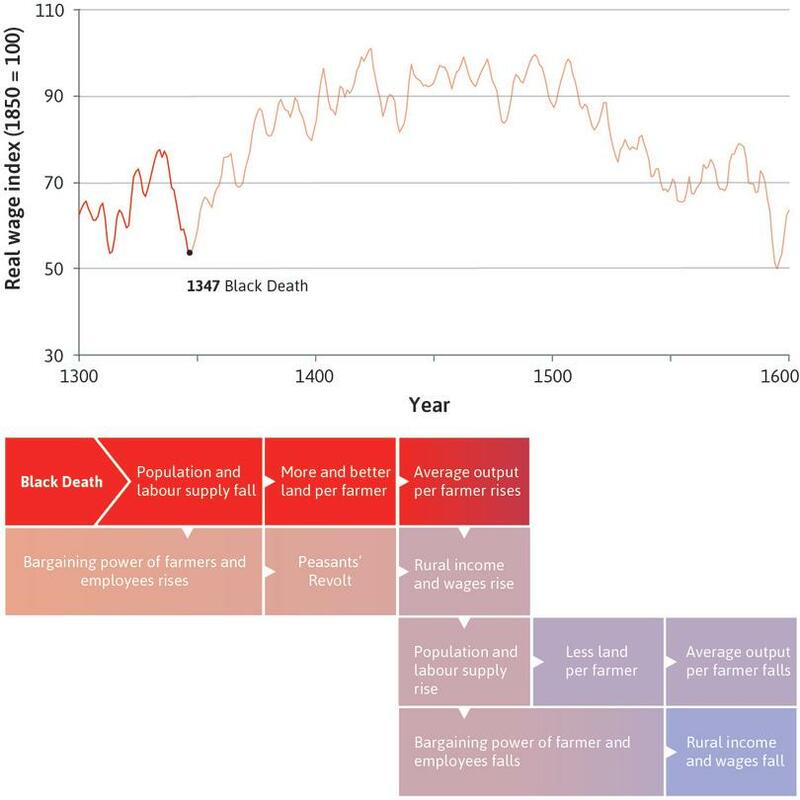 The decline of the number of people working on farms during the Black Death raised agricultural productivity according to the principle of diminishing average product of labour. Farmers were better off, whether they owned their land or paid a fixed rent to a landlord. Employers in cities had to offer higher wages too, to attract workers from rural areas. The causal links in Figure 2.19 combine the two features of the Malthusian model with the role of political developments as responses to, and causes of changes in, the economy. When, in 1349 and 1351, King Edward passed laws to try to restrain wage increases, economics (the reduced labour supply) won out over politics: wages continued to rise, and peasants began to exercise their increased power, notably by demanding more freedom and lower taxes in the Peasants’ Revolt of 1381. But when the population recovered in the sixteenth century, labour supply increased, lowering wages. Based on this evidence, the Malthusian explanation is consistent with the history of England at this time. Exercise 2.9 What would you add? The cause-and-effect diagram that we created in Figure 2.19 made use of many ceteris paribus assumptions. How does this model simplify reality? Try redrawing the figure to include other factors that you think are important. Look again at Figure 2.1 and Figure 2.19 showing graphs of real wages in England between 1300 and 2000. During the bubonic plague of 1348 and 1351, between one-quarter and one-third of Europe’s population died. In the seventeenth and eighteenth centuries, the wages of unskilled workers relative to the incomes of land owners were only one-fifth of what they had been in the sixteenth century. What can we conclude from this information? According to the Malthusian model, the fall in the population due to the bubonic plague would have led to an increase in the average productivity of workers, causing the observed rise in the real wage post-plague. The doubling and halving of the real wage index over 250 years from around 1350 is contrary to the Malthusian model. The fall in the unskilled workers’ share of total output in the seventeenth and eighteenth centuries was due to the fall in their average product of labour. The fall in the relative wages of the unskilled workers in the seventeenth and eighteenth centuries was one of the factors that led to the eventual shooting up of the real wage in the nineteenth century, seen in the graph. In the Malthusian model, fewer workers means higher average productivity, increasing output per capita. Given that their bargaining power did not remain constant but actually increased, workers claimed a larger share of this output and real wages rose. According to the Malthusian model, the increase in population caused by the rise in real wages would have led to a decrease in average productivity, leading to an eventual fall in the real wage back down to subsistence level. This seems to be what is observed in the graph. The average product of labour determines the size of the pie (the total output), but what share of this is claimed by the workers is determined by their bargaining power, which diminished over the Malthusian cycles in the graph. On the contrary, wage growth happened in spite of the low wages relative to the incomes of the land owners. The key to this process was that wages remained high compared to the prices of energy and capital goods, leading to innovation for less labour-intensive technology. How does the growth of real wages compare with the growth of real GDP per capita as a measure of economic progress? Try out your arguments on others. Do you agree or not? If you disagree, are there any facts that could resolve your disagreement, and what are they? If there are not, why do you disagree? We have focused on farmers and wage earners, but not everyone in the economy would be caught in a Malthusian trap. As population continues to grow, the demand for food also grows. Therefore the limited amount of land used to produce the food should become more valuable. In a Malthusian world, a rising population should therefore lead to an improvement in the relative economic position of landowners. This occurred in England: Figure 2.19 shows that real wages did not increase in the very long run (they were no higher in 1800 than in 1450). And the income gap between landowners and workers increased. In the seventeenth and eighteenth centuries, the wages of unskilled English workers, relative to the incomes of landowners, were only one-fifth of what they had been in the sixteenth century. But while wages were low compared to the rents of landlords, a different comparison of relative prices was the key to England’s escape from the Malthusian trap: wages remained high compared to the price of coal (Figure 2.10) and even increased compared to the cost of using capital goods (Figure 2.11), as we have seen. Nassau Senior, the economist who lamented that the numbers perishing in the Irish famine would scarcely be enough to do much good, does not appear compassionate. But he and Malthus were right to think that population growth and a diminishing average product of labour could create a vicious circle of economic stagnation and poverty. However, the hockey-stick graphs of living standards show they were wrong to believe that this could never change. They did not consider the possibility that improvements in technology could happen at a faster rate than population growth, offsetting the diminishing average product of labour. The permanent technological revolution, it turns out, means that the Malthusian model is no longer a reasonable description of the world. Average living standards increased rapidly and permanently after the capitalist revolution. 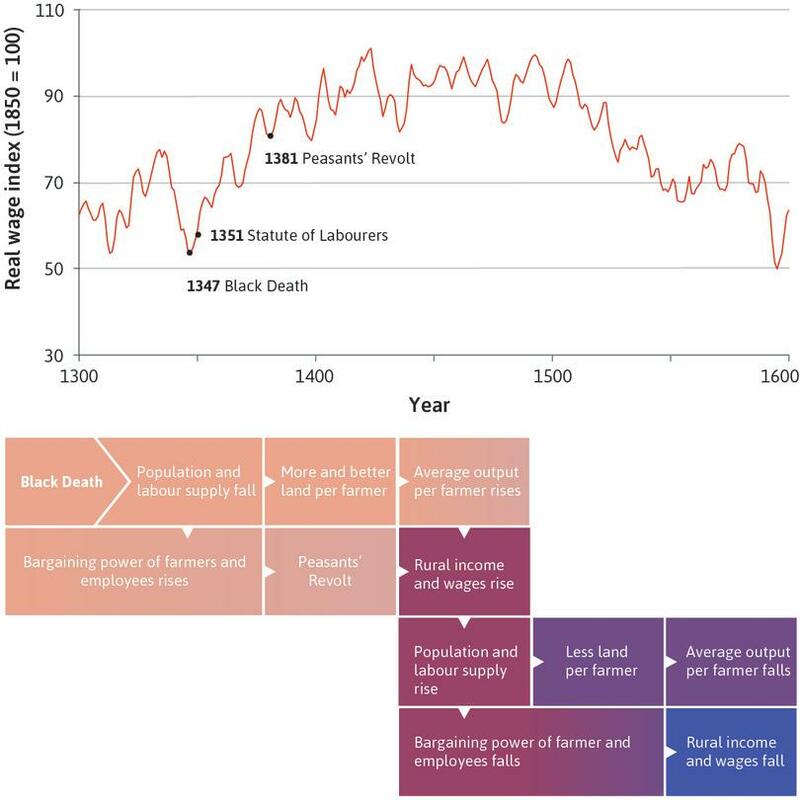 Figure 2.20 shows the real wage and population data from the 1280s to the 1860s. As we saw in Figure 2.18, from the thirteenth to the sixteenth century there was a clear negative relationship between population and real wages: when one went up the other went down, just as Malthusian theory suggests. Between the end of the sixteenth and the beginning of the eighteenth century, although wages rose there was relatively little population growth. Around 1740, we can see the Malthusian relationship again, labelled ‘18th century’. Then, around 1800, the economy moved to what appears to be an entirely new regime, with both population and real wages simultaneously increasing. This is labelled ‘Escape’. Escaping the Malthusian trap. Note: Labour productivity and real wages are five-year centred moving averages. 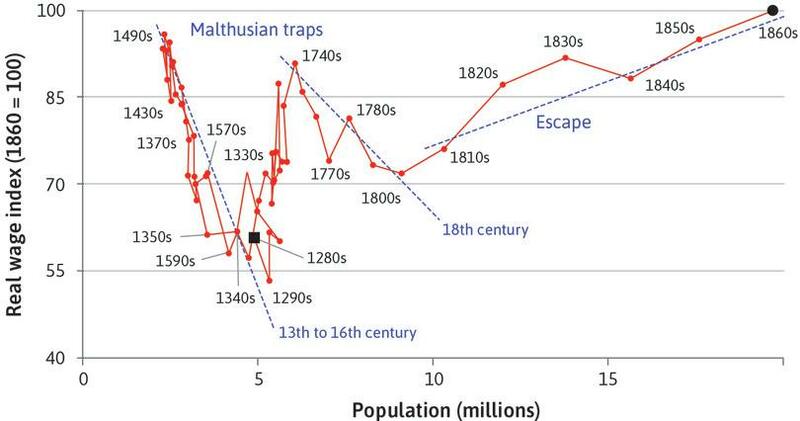 Figure 2.20 Escaping the Malthusian trap. Note: Labour productivity and real wages are five-year centred moving averages. Robert C. Allen. 2001. The Great Divergence in European Wages and Prices from the Middle Ages to the First World War. Explorations in Economic History 38 (4): pp. 411–447. Figure 2.21 zooms in on this ‘great escape’ portion of the wage data. Figure 2.21 Escaping the Malthusian trap. Note: Labour productivity and real wages are five-year centred moving averages. In the eighteenth century, the Malthusian relationship persisted. In the nineteenth century, the economy appears to become a non-Malthusian regime, with real wages rising while population was increasing. Figure 2.21a In the eighteenth century, the Malthusian relationship persisted. In the nineteenth century, the economy appears to become a non-Malthusian regime, with real wages rising while population was increasing. The story begins with technological improvements, such as the spinning jenny and the steam engine, that increased output per worker. Innovation continued as the technological revolution became permanent, displacing thousands of spinsters, weavers and farmers. Figure 2.21b The story begins with technological improvements, such as the spinning jenny and the steam engine, that increased output per worker. Innovation continued as the technological revolution became permanent, displacing thousands of spinsters, weavers and farmers. The loss of employment reduced workers’ bargaining power, keeping wages low, seen in the flat line between 1750 and 1830. The size of the pie was increasing, but the workers’ slice was not. Figure 2.21c The loss of employment reduced workers’ bargaining power, keeping wages low, seen in the flat line between 1750 and 1830. The size of the pie was increasing, but the workers’ slice was not. In the 1830s, higher productivity and low wages led to a surge in profits. Profits, competition, and technology drove businesses to expand. The demand for labour went up. People left farming for jobs in the new factories. Figure 2.21d In the 1830s, higher productivity and low wages led to a surge in profits. Profits, competition, and technology drove businesses to expand. The demand for labour went up. People left farming for jobs in the new factories. The supply of labour fell when business owners were stopped from employing children. The combination of higher labour demand and lower supply enhanced workers’ bargaining power. Figure 2.21e The supply of labour fell when business owners were stopped from employing children. The combination of higher labour demand and lower supply enhanced workers’ bargaining power. The power of working people increased as they gained the right to vote and formed trade unions. These workers were able to claim a constant or rising share of the increases in productivity generated by the permanent technological revolution. Figure 2.21f The power of working people increased as they gained the right to vote and formed trade unions. These workers were able to claim a constant or rising share of the increases in productivity generated by the permanent technological revolution. The story of the permanent technological revolution demonstrates that there are two influences on wages. How much is produced: we can think of this as the size of the pie to be divided between workers and the owners of other inputs (land or machines). The share going to workers: This depends on their bargaining power, which in turn depends on how wages are determined (individually, or through bargaining with trade unions, for example) and the supply and demand for workers. If many workers are competing for the same job, wages are likely to be low. After 1830, the pie continued growing, and the workers’ share grew along with it. Britain had escaped from the Malthusian trap. This process would soon be repeated in other countries, as Figures 1.1a and 1.1b showed. 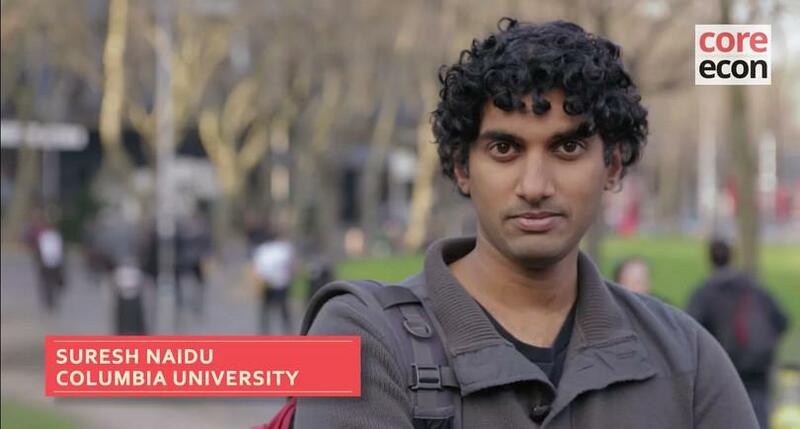 In our ‘Economist in action’ video, Suresh Naidu, an economic historian, explains how population growth, technological development and political events interacted to produce the real wage hockey stick. 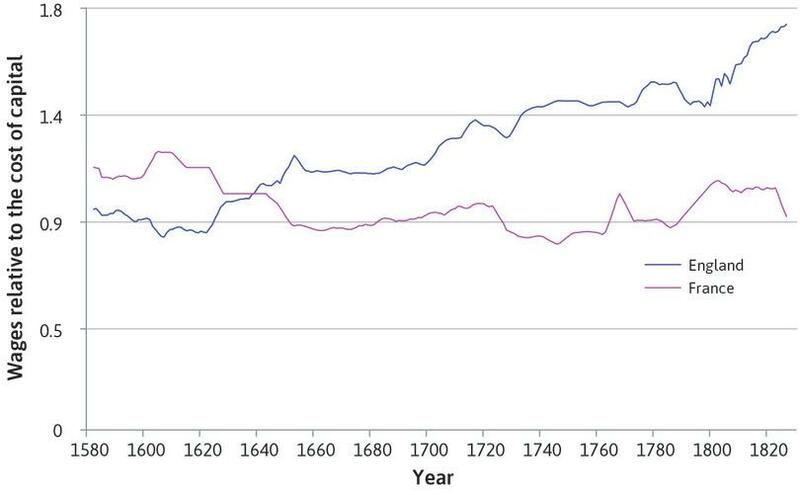 Look again at Figure 2.20, which plots real wages against population in England from the 1280s to the 1860s. According to Malthus, with diminishing average product of labour in production and population growth in response to increases in real wages, an increase in productivity will result in a larger population but not higher real wages in the long run. Based on the information above, which of the following statements is correct? Between the 1800s and the 1860s, population grows as real wages rise. This is entirely in line with Malthus’s description of the economy’s growth. There is a clear evidence of a persistent and continuous Malthusian trap between the 1280s and the 1800s. The Malthusian traps seem to occur in a cycle of 60 years. The Malthusian model does not take into account the possibility of a persistent positive technology shock that may offset the diminishing average product of labour. It is true that Malthus assumes population growth in response to real wage increases. However, as population increases the average per capita output falls, resulting in a fall in real wages back to subsistence level. This is not evident in the graph post-1800s. There are actually two periods—between the 1280s and the 1590s, and between the 1740s and the 1800s—when a Malthusian trap is evident. There is, however, the period in between when the negative relationship between the real wage and population seems to break down (no population growth despite the wage increase). Though the second cycle of the Malthusian trap lasted about 60 years (between the 1740s and the 1800s), the first cycle seems to have lasted around 300 years. If technological developments increase the average productivity of labour faster than population growth decreases it, then population growth and real wages can coexist. This is what is shown by the escape trajectory of the English economy after the eighteenth century. Why is private property important for technological progress to occur? 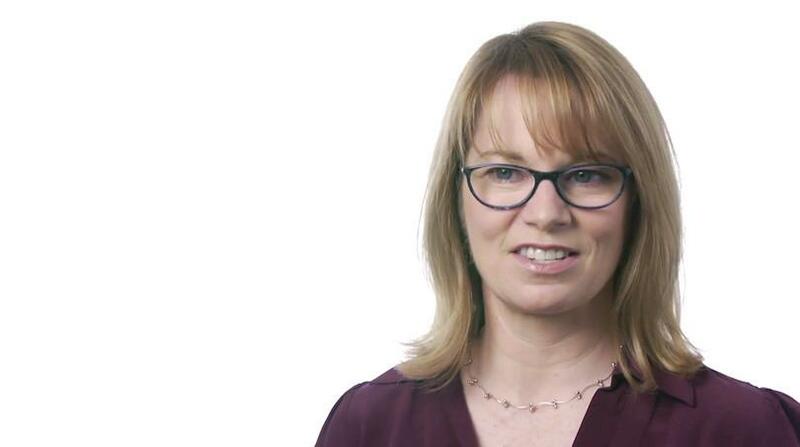 Explain how markets can provide both carrots and sticks to encourage innovation. How can production in firms, rather than families, contribute to the growth of living standards? We have introduced an economic model in which firms’ choice of production technologies depends on the relative prices of inputs, and the economic rent from adopting a new technology provides an incentive for firms to innovate. Testing this model against historical evidence shows that it could help to explain why the Industrial Revolution occurred in Britain in the eighteenth century. 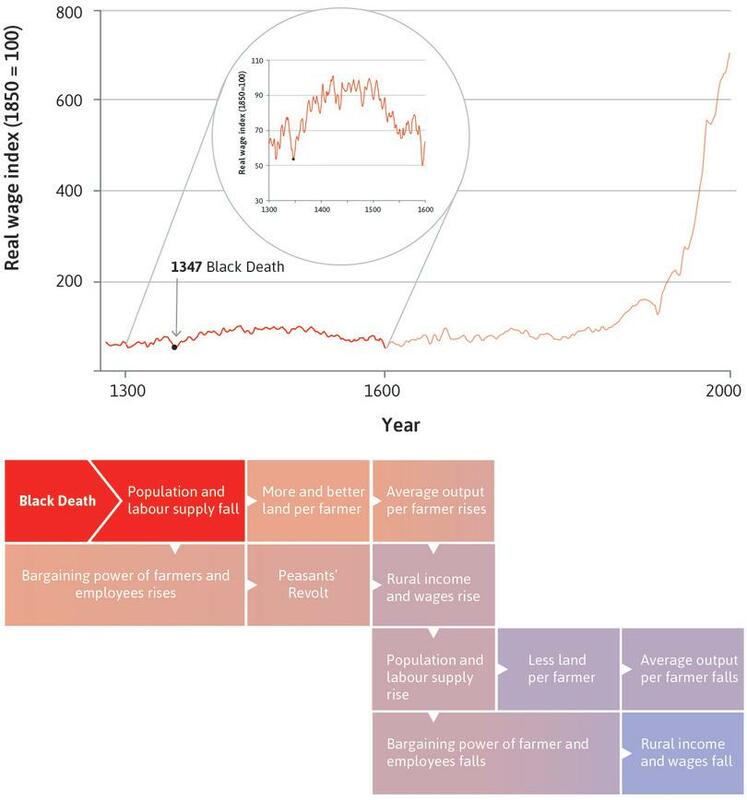 We showed how the Malthusian model of a vicious circle, in which population growth offset temporary gains in income, could explain stagnation in living standards for centuries before the Industrial Revolution, until the permanent technological revolution allowed an escape due to improvements in technology. Lee, James, and Wang Feng. 1999. ‘Malthusian models and Chinese realities: The Chinese demographic system 1700–2000’. Population and Development Review 25 (1) (March): pp. 33–65. Malthus, Thomas R. 1798. An Essay on the Principle of Population. London: J. Johnson, in St. Paul’s Church-yard. Library of Economics and Liberty. McNeill, William Hardy H. 1976. Plagues and Peoples. Garden City, NY: Anchor Press. Mokyr, Joel. 2004. The Gifts of Athena: Historical Origins of the Knowledge Economy, 5th ed. Princeton, NJ: Princeton University Press. Pomeranz, Kenneth L. 2000. The Great Divergence: Europe, China, and the Making of the Modern World Economy. Princeton, NJ: Princeton University Press. Skidelsky, Robert. 2012. ‘Robert Skidelsky—portrait: Joseph Schumpeter’. Updated 1 December 2007.